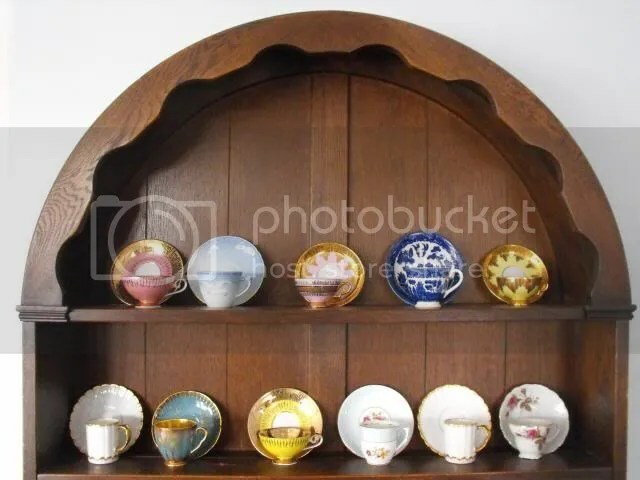 Last week’s Semi-Wordless Wednesday turned out pretty well, so here’s another random assortment of things I have made! 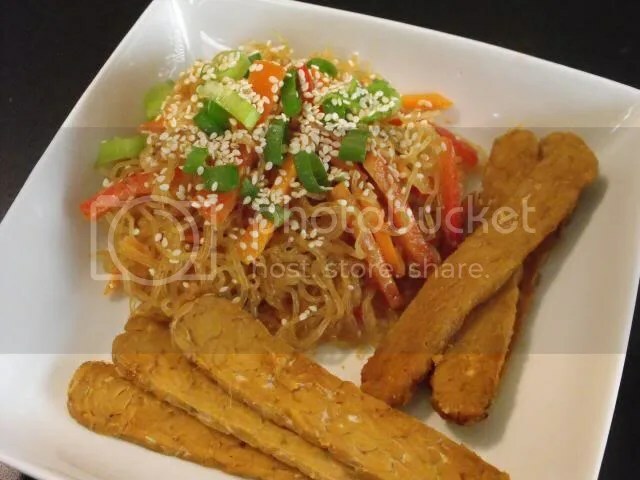 Almond Butter Sesame Kelp Noodles from Practically Raw with Sesame Garlic Marinated Tempeh. Loved the noodles, not so much the tempeh. 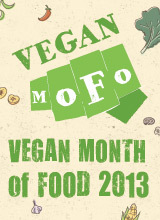 In what has seemed to become my unofficial theme for VeganMoFo 2013, here is another post about something that happened last year! 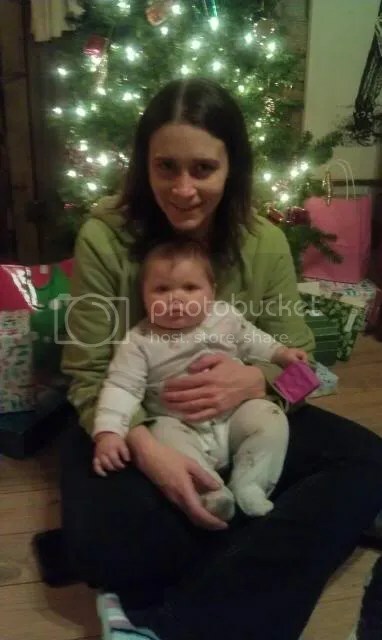 My brother was stationed at Fort Hood mid-last year and so he, my sister-in-law, and their baby Josie moved to Killeen, Texas. 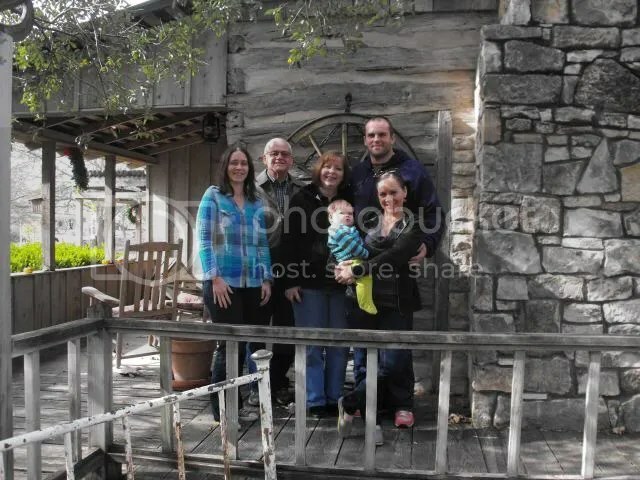 My family decided to meet there for Christmas so they wouldn’t have to travel, and my mom found Weatherstone cabin bed and breakfast in the nearby town of Salado, which had the perfect amount of space for all six of us. Flights into Killeen were super expensive, so I flew into Austin and rented a car instead. I was hoping we would be able to work in a day trip to Austin but knew with the baby it might be difficult, so I wanted to choose a restaurant for a late lunch after landing. It was really hard to choose one place from all the awesome-looking vegan food in Austin! 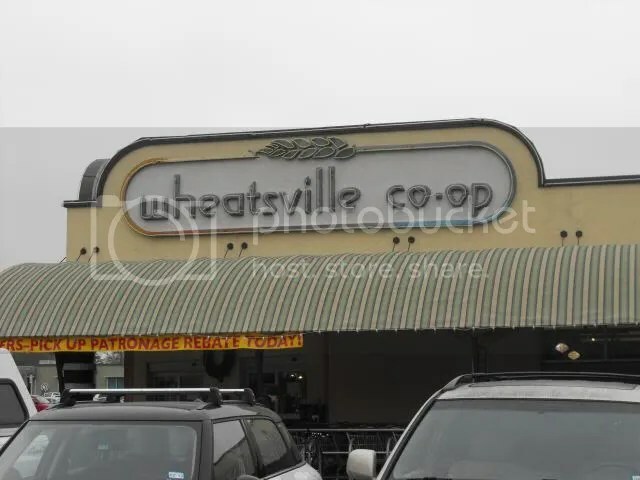 In the end I went with Wheatsville Coop, first because I had heard the tales of their popcorn tofu, and second because I wasn’t sure what would be available food-wise at the cabin or in Salado, so I wanted to pick up a few supplies. The Buffalo Popcorn Hero was really tempting, but I stuck with the classic Popcorn Tofu Po’boy, which comes with cashew tamari and fresh veggies. 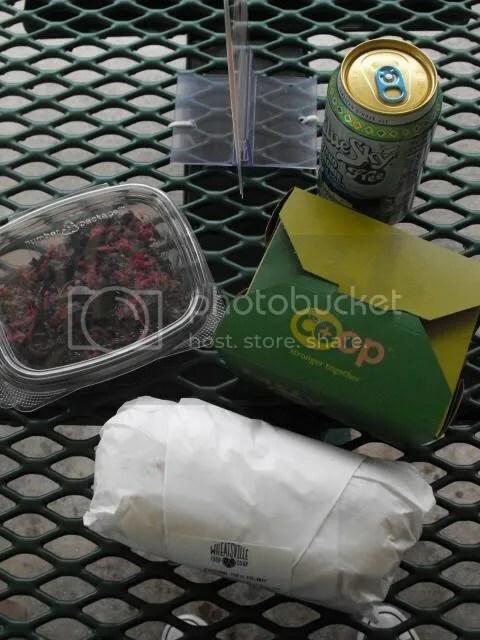 I also picked up a kale and beet salad, mac and cheese from the hot bar, an oatmeal cream pie, and a Blue Sky Jamaican Ginger Ale. 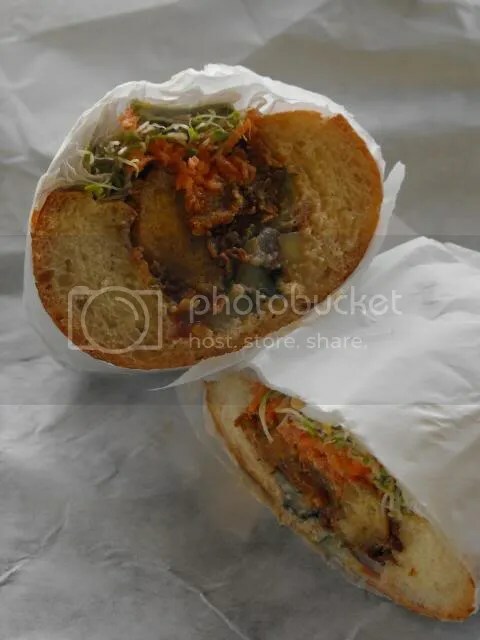 The sandwich was good; the tofu was firm and chewy and made great little fried nuggets. The salad was really nice, a good mixture of sweet and tangy. The mac was saucy, warm, and cheesy. 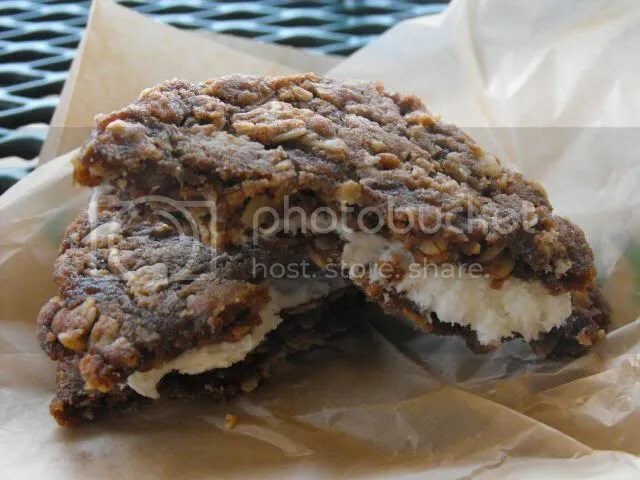 The oatmeal cream pie was a good simulation of the Little Debbie classic; the cookies were chewy and had a strong brown sugar flavor. 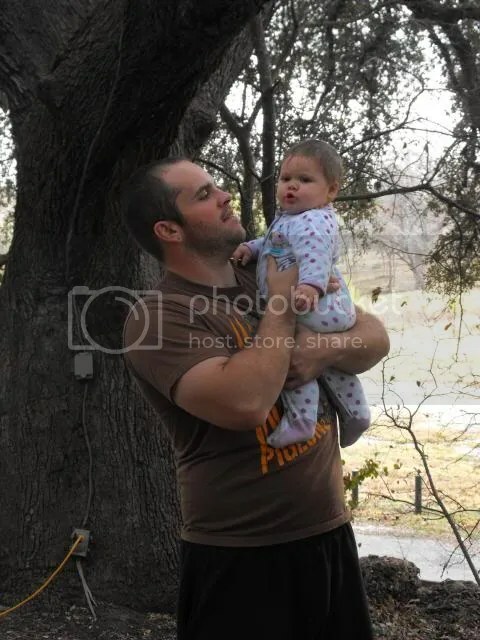 Full, happy, and tired, I made the drive to Salado, where I met my baby niece for the first time. 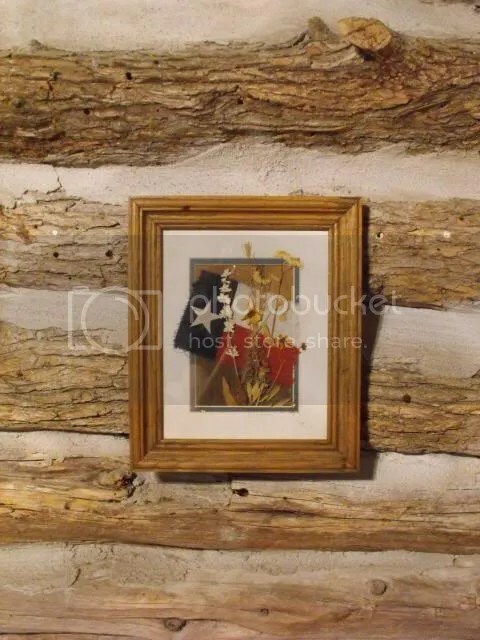 That night we hung around the cabin, ordering pizza delivery for dinner. I wasn’t very hungry after my big late lunch, so I just asked for a double side salad. 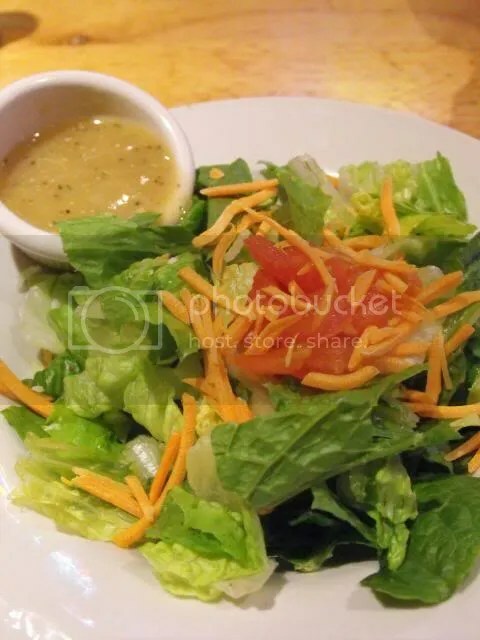 What I didn’t realize is that apparently they put shredded cheese on side salads at a lot of places in the area. (This began a trend I saw throughout my few days there.) I just picked the cheese off as best I could. We chose 9AM as our breakfast time, and being on west coast time and in vacation mode, I slept right up until then (as I did the next two mornings). Our host Kay had already been hard at work and had everything ready. My mom had let them know about my diet when booking the rooms and they had said they could accommodate me, but I still had no idea what to expect. 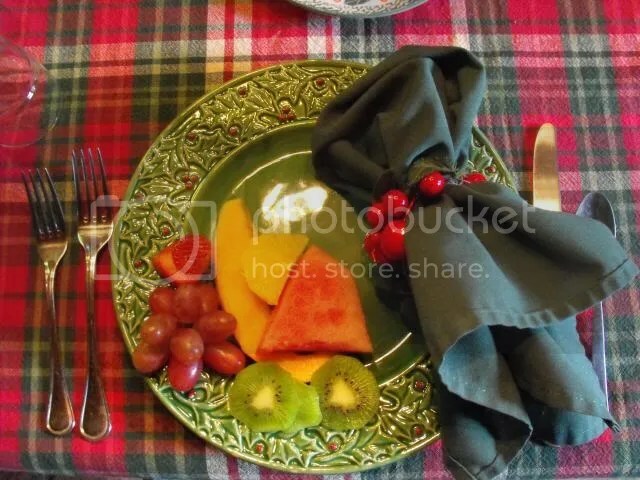 Fresh fruit on a pretty plate is always a good way to start. 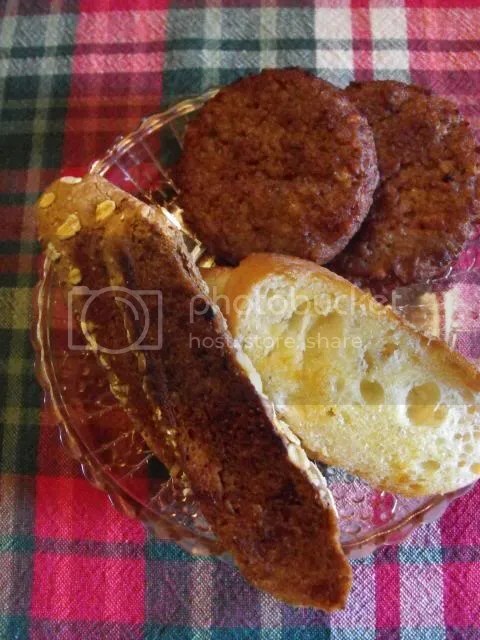 While the rest of my family was served an egg casserole, I got my own little plate of veggie sausage patties and bread which had been toasted in margarine. Kay picks up the bread, which was delicious, from a local bakery. She also had coffee brewed and offered refills while we ate, in addition to seconds on anything. 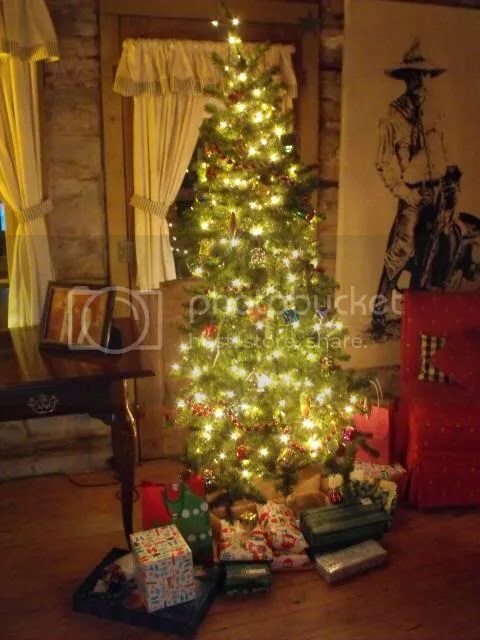 She had soy milk for me to use in my coffee, and the cabin was stocked with bottled water, soda, tea, and a few snacks. 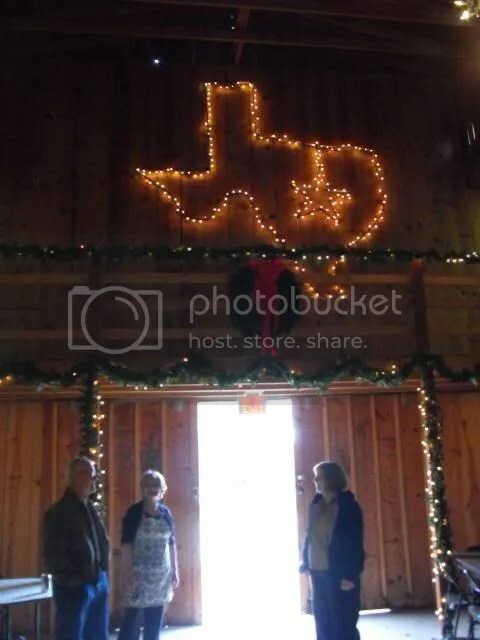 We didn’t really have an agenda for the day, so I spent some time taking in the cute Texas decor. 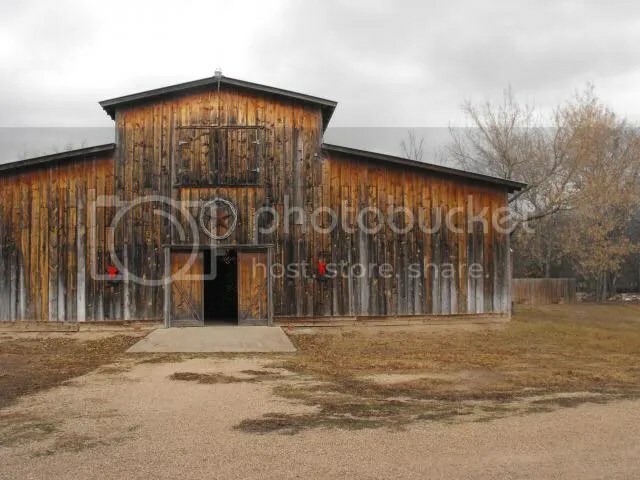 We also got a tour of the barn out back, which they rent out for events. We eventually headed out and walked down Main Street, which is lined with antique shops and all sorts of cute little stores. We ended up at Adelea’s on Main for lunch, which Kay had recommended. I forgot to take a picture of my meal, but not because it wasn’t good! They didn’t have anything vegan on the menu but I noticed that hummus was available as an appetizer special, and there was a veggie wrap that usually came with black beans and artichoke dip. I asked our waiter if they could sub hummus for the dip on the wrap and he seemed a little flummoxed by my request, but immediately offered to ask the chef and returned with a positive answer. Despite being a kind of random gathering of ingredients, the wrap was very tasty and nicely grilled, and it came with their freshly made kettle chips. I first tried their “Vaquero” Shiraz/Tempranillo Blend, which I like so much that I bought a bottle to bring home. Shiraz is my favorite wine, and this was a lighter, tangier spin on it. 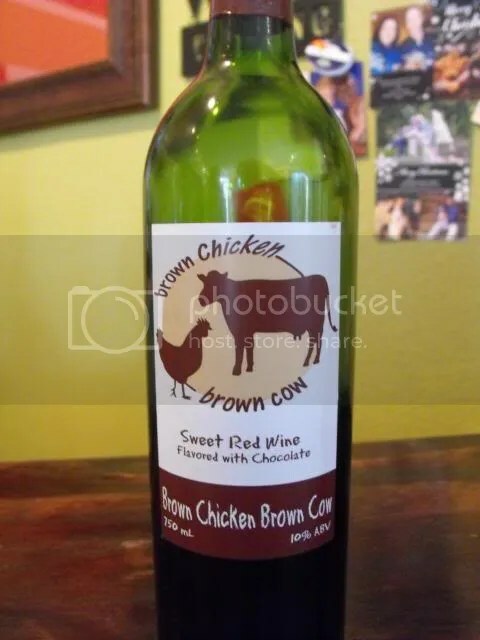 I also tried the Brown Chicken Brown Cow, a sweet shiraz flavored with chocolate. 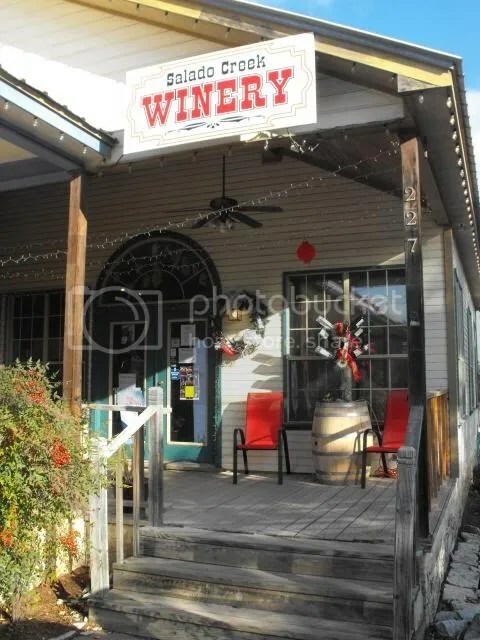 The winery’s website says “As far as we know the only ‘chocolate’ wine made in Texas!”. It was definitely good, but incredibly rich. A few ounces went a long way. For dinner that night we headed to Johnny’s Steaks & BBQ, another local restaurant which had been recommended. It’s the type of joint that puts meat in all the side dishes, so I went for the ol’ side salad and french fries dinner. The point of being there was to spend time with family, so as long as I got some calories in my belly it was alright. Josie didn’t want to sit in the high chair, so we took turns holding her and walking around the restaurant, while she made friends with all the other guests. 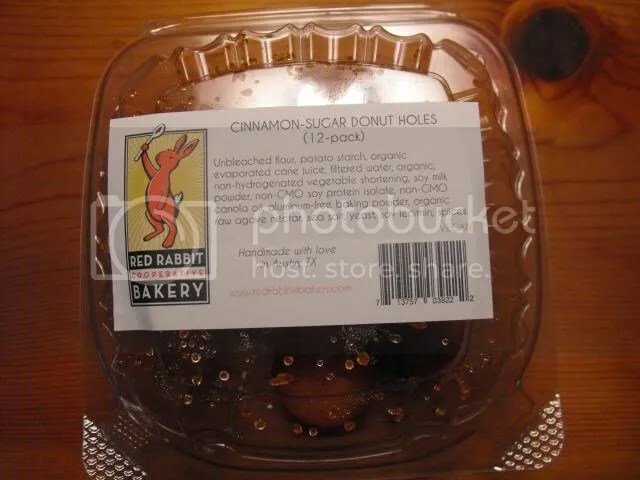 After we got back I sampled the Red Rabbit Bakery donut holes I had bought at Wheatsville. They were a little dry, but to be fair it had probably been a few days since they were made at that point. I liked the flavor. My brother did not, but my brother is picky. 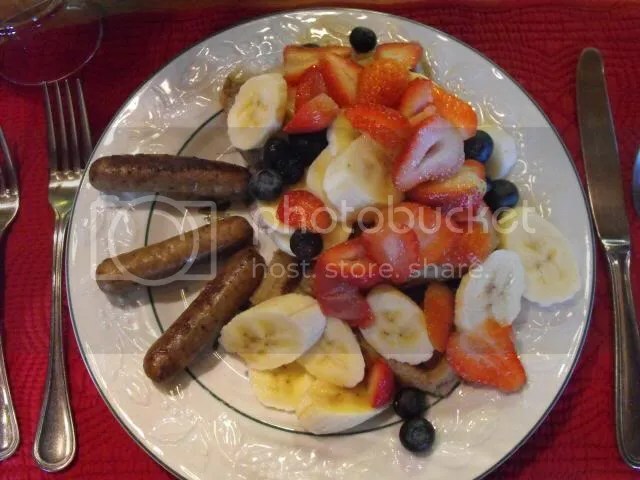 The next morning, breakfast for the family was french toast, and for me it was waffles piled high with fruit, and veggie sausage links. The waffles were also gluten free, as Kay was looking to expand her resources for special diets, and they were quite good. That day we headed out to the Round Rock Premium Outlets for some shopping action. We took a break for lunch at the food court, which didn’t seem too promising. 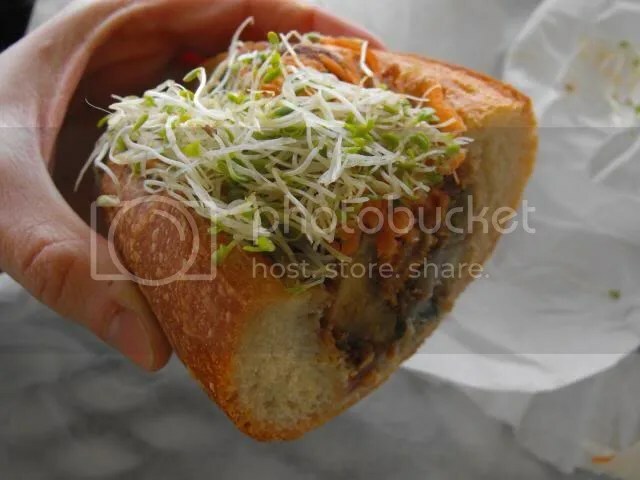 I did find Phil’s Philly Grill which had a veggie philly on the menu, so I asked for that without cheese plus a side salad. Again, the side salad came with unadvertised cheese which I had to pick off. I also snagged a few of my brother’s curly fries. After more shopping and the drive back a few of us weren’t feeling so well, so we decided to stay in and take it easy that night. 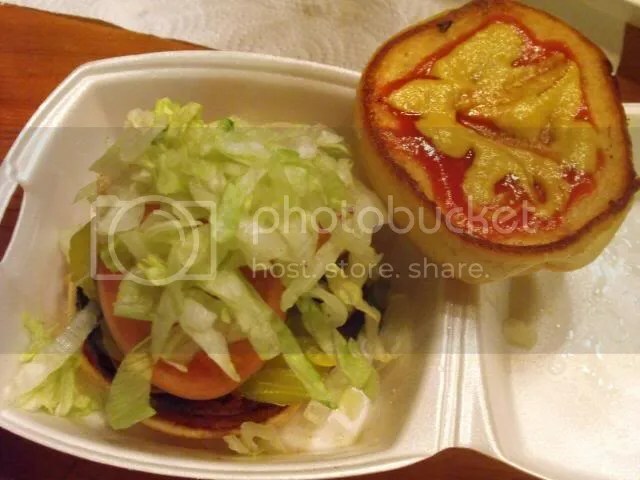 We were going to call for pizza again, when after searching around I randomly found that the burger place down the road was advertising a vegan veggie burger, actually using the word vegan! That was a surprise for such a small town. My mom and I headed to Old Fashioned Burgers and Ice-Cream and placed our order with the one lady working there, who promptly started working hard to make all the food. I think she may have buttered all the buns but I didn’t say anything since she was clearly busting it to get the food done. The burger was pretty tasty, and we shared a big order of fries too. 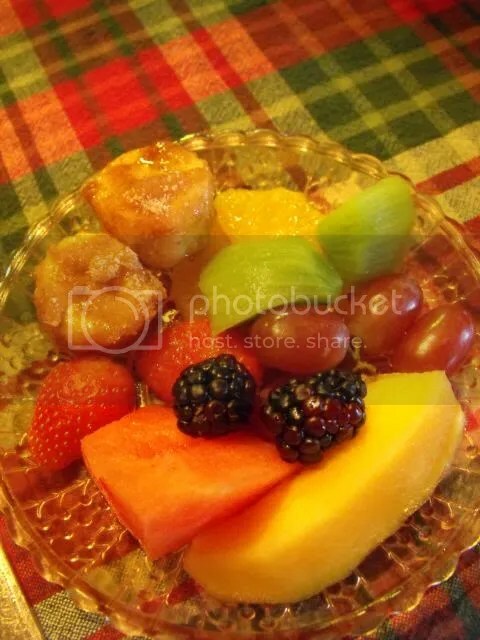 The next morning we were greeted with a gigantic platter of fruit. 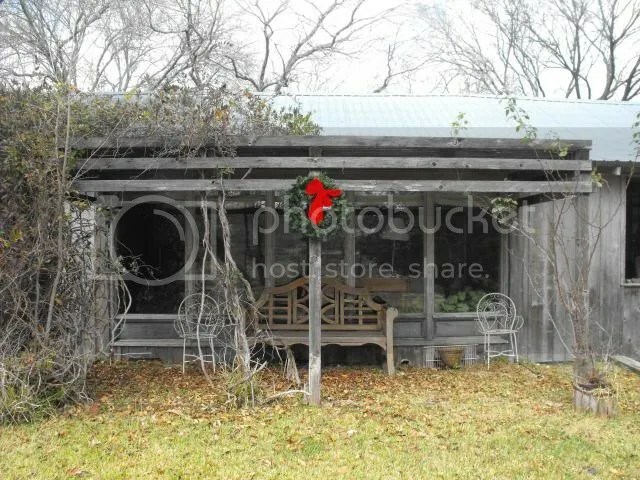 I don’t know where Kay was buying the produce, but she managed to find good melons and berries in Texas in December. 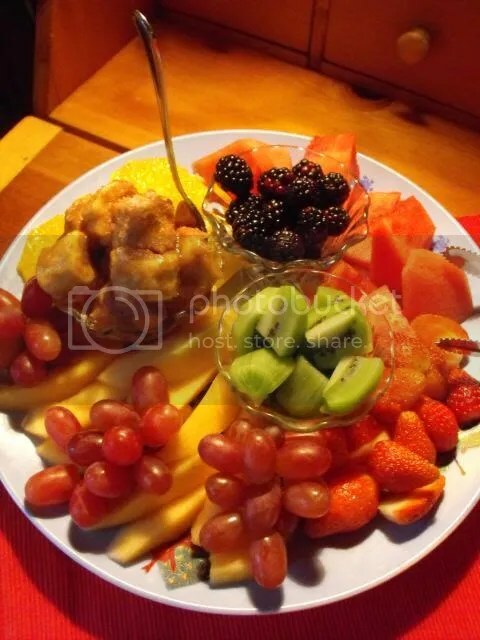 The highlight of the fruit was the sugared bananas. She just rolled sliced bananas in cinnamon sugar, and the sugar takes on the moisture from the bananas and makes something like a glaze. Delicious. 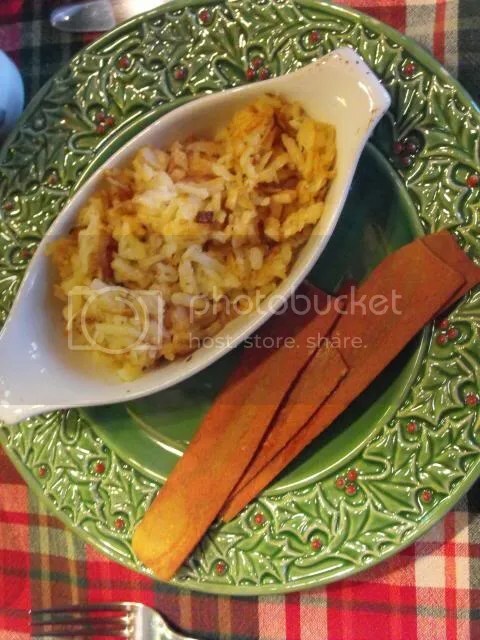 My main dish was hash browns, veggie bacon, and biscuits made with margarine. That day we ventured to my brother and sister-in-law’s house in Killeen to check it out, watch football, and for them to get a workout in. They’re very serious about weight training and power lifting – no breaks on vacation! For lunch we headed to Red Onion India Bistro, which I was very excited about, only to find that they were closed on Sundays. Sad Face. There was a McAlister’s Deli next door, a suitable second choice. 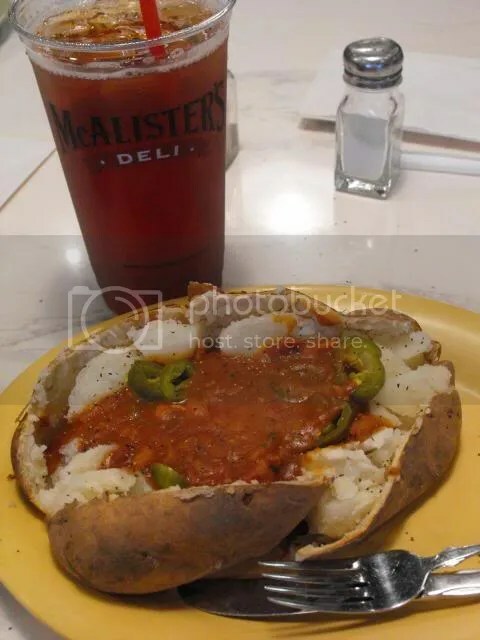 I went for the Spud Ole with veggie chili and jalapenos (no cheese). 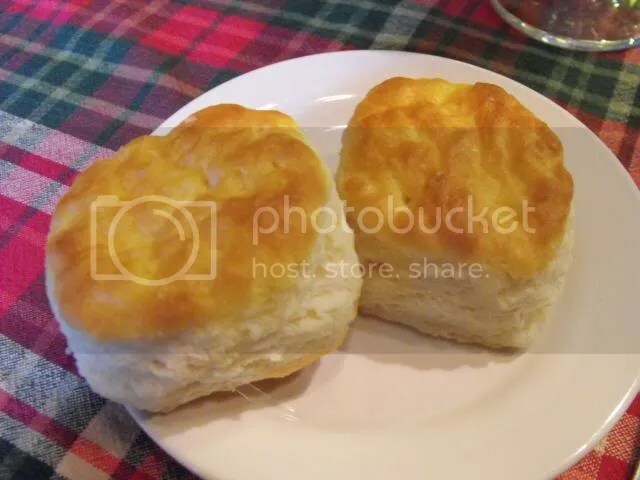 I used to go to McAlister’s a lot in Florida, so this was a fun trip down memory lane, as well as a filling meal. That afternoon, Tate gave us a tour around Fort Hood. I had never been on a military base, so it was a really interesting experience. I didn’t realize that some bases are open to the public; Fort Hood has a visitor’s center and two museums. 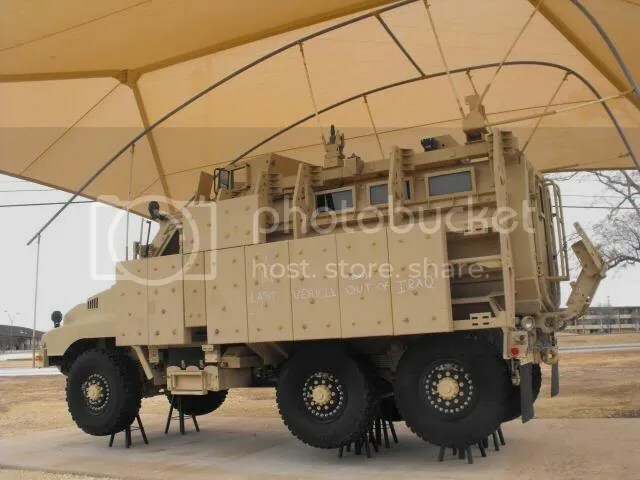 It’s a lot like a college campus, there are offices, barracks, sports fields and training grounds, as well as business like gas stations, restaurants, and the commissary. This was the last vehicle out of Iraq after the US withdrew. Very cool to see. 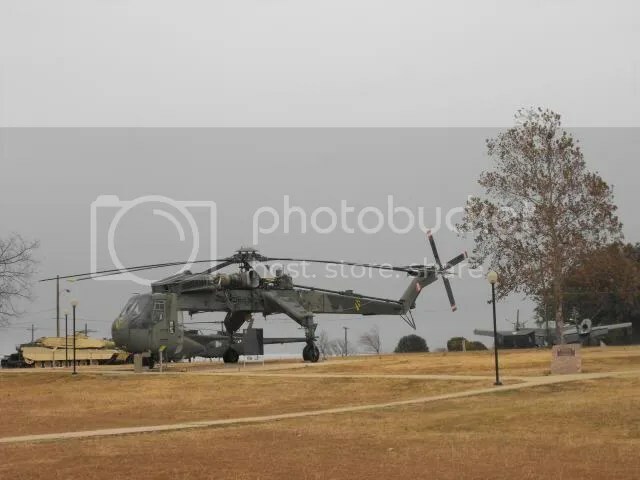 I’m not sure if you can tell the scale of this helicopter, but it is massive. Its job is to pick up and move other vehicles and equipment. 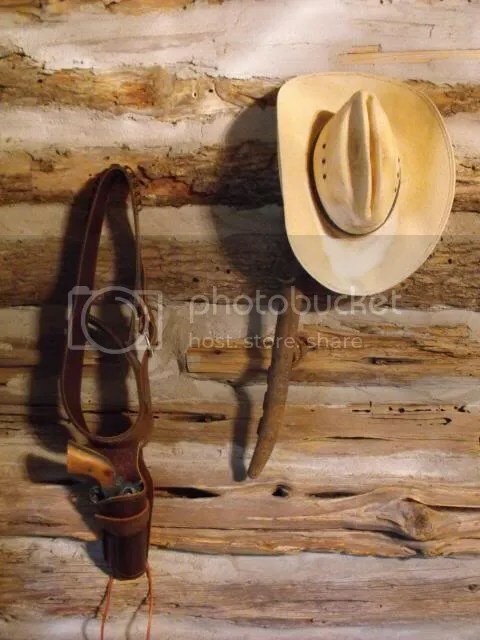 For dinner, we went to Texas Roadhouse. 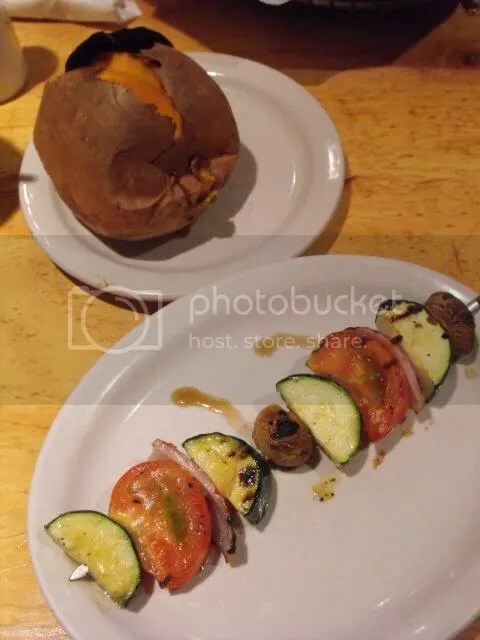 I had a side salad with a dressing off of the “light” menu, a baked sweet potato, and a vegetable skewer. Not bad for a vegan steakhouse meal. The next morning I was up early, saying goodbye and driving back to the Austin airport. 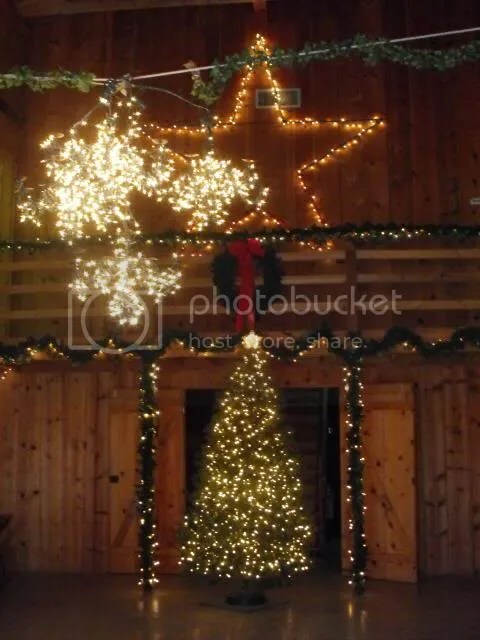 I’ll remember this trip as a lot of things: meeting my niece for the first time, spending time in a cute little Texas town, and eating a lot of potatoes. A lot. It’s been a while since I wrote anything here about my regular, every day eats. I have been cooking (and of course eating) but I’ve also been extremely busy, so my meals have had to be more of the simple and quick variety. My current project is that I’m training for the Rock ‘n’ Roll Los Angeles Half Marathon with Team ASPCA. The ASPCA’s mission is to provide effective means for the prevention of cruelty to animals throughout the United States, a mission close to my heart. I’m really happy to be a part of Team ASPCA and honored to be raising both awareness and funding to support the ASPCA’s programs! Please check out the Raffle Page on The Vegan Weight Watcher and consider donating to The ASPCA! The deadline to enter for the first drawing is this Friday, September 14th, at 12PM noon PDT. I started running around July of last year, and have been training for one race or another ever since. Between working full time, training, and other obligations, I don’t have much time to cook, but on the other hand, I need healthy meals to fuel my training. So, I’ve turned to a few particular cookbooks and fast meals to get by. First up, Appetite for Reduction by Isa Chandra Moskowitz. 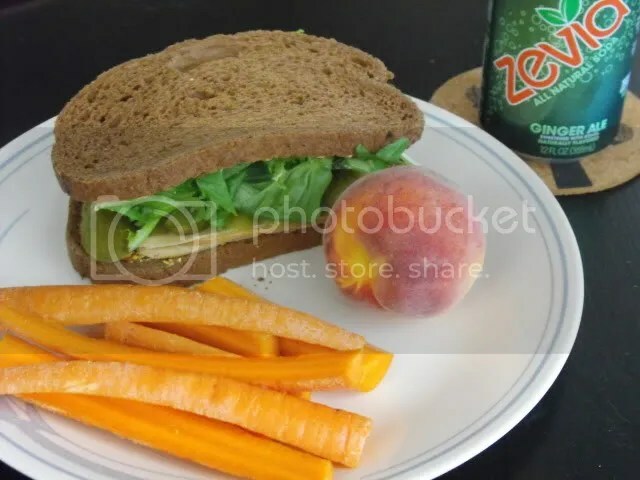 I posted a review here and more photos here, and this continues to be my go-to for flavorful and balanced meals that don’t take a long time. The book has an index of recipes that are ready in under 30 minutes, which makes it even easier to pick out quick meals. This is Goddess Nicoise Salad. I don’t normally love olives but liked them in this, and the cooked green beans and potatoes made it feel hearty enough to be a full meal. 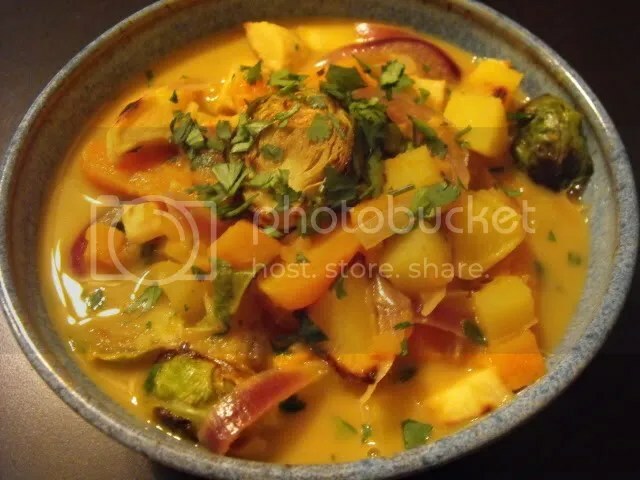 Thai Roasted Root Vegetable Curry is the perfect way to use fall CSA produce. 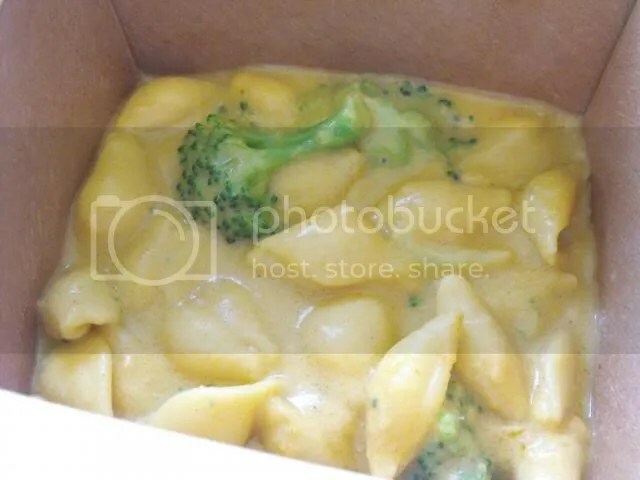 Pasta con Broccoli may look a little dry, but it’s actually quite flavorful and moist. I added chickpeas to round out the meal, as the author suggests. 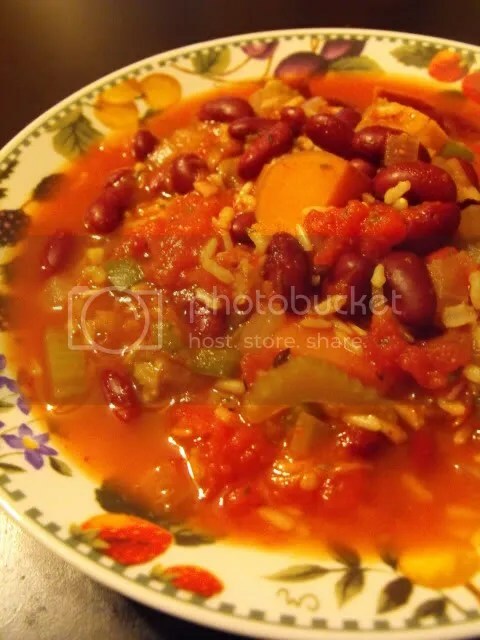 With only about 20 minutes active cooking time involved, Kidney Bean & Butternut Jamba Stew is a delicious, spicy meal in a bowl. 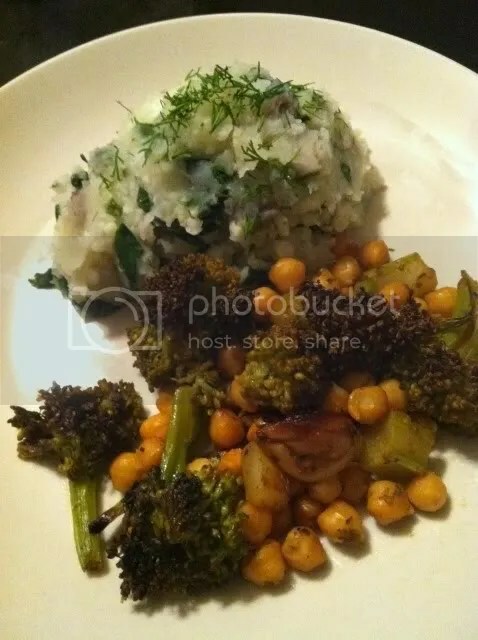 Forty-Clove Broccoli & Chickpeas and Colipots was really intensely delicious, but not as filling as I had hoped. 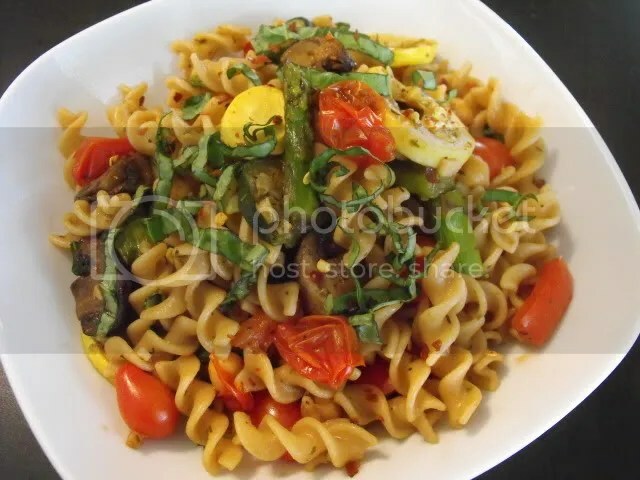 Fusilli Roasted Vegetable Primavera teaches you a great way to make a flavorful summer pasta without too much effort. 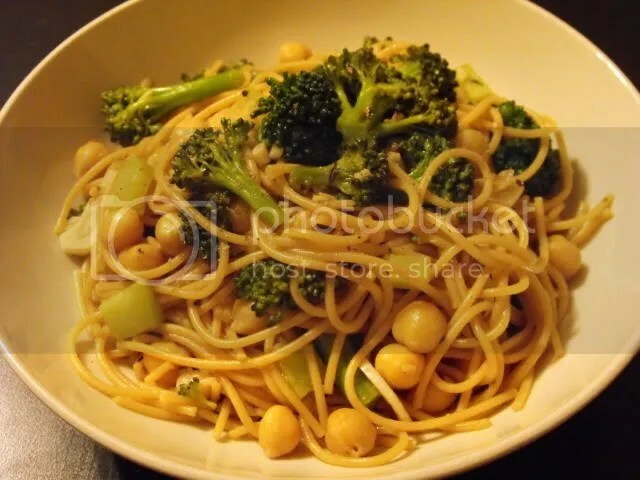 I added mushrooms and chickpeas, and wouldn’t make it again without. Quick Fix Vegan by Robin Robertson is a cookbook which is geared specifically toward speedy vegan meals. Luckily, most of the recipes are relatively healthy too, with plenty of veggies. Looking through the index, there are plenty more recipes from this book that I want to try! 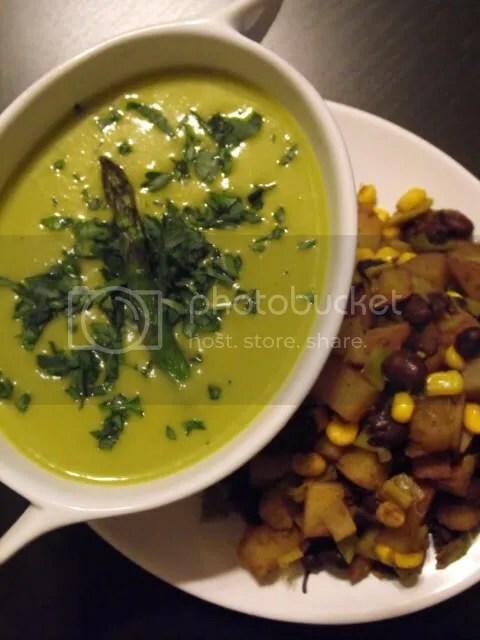 The Roasted Asparagus Soup gets its creaminess from potato and non-dairy milk. The soup was delicious, but I thought it missed some of the asparagus flavor by adding the other ingredients. On the side, I made a quick potato, corn, and black bean hash. 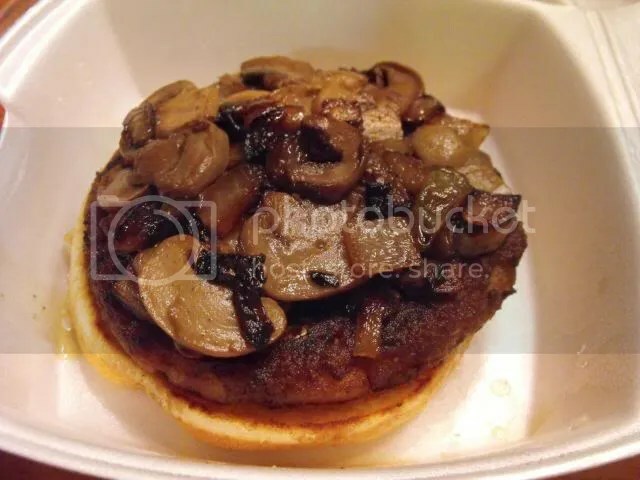 Barbecue Pinto and Portobello is like a souped up version of baked beans, with a fast homemade barbecue sauce. It’s intended to be a sandwich filling, but in an effort to keep it a little more light, I had the beans on their own with a side of coleslaw pasta salad. 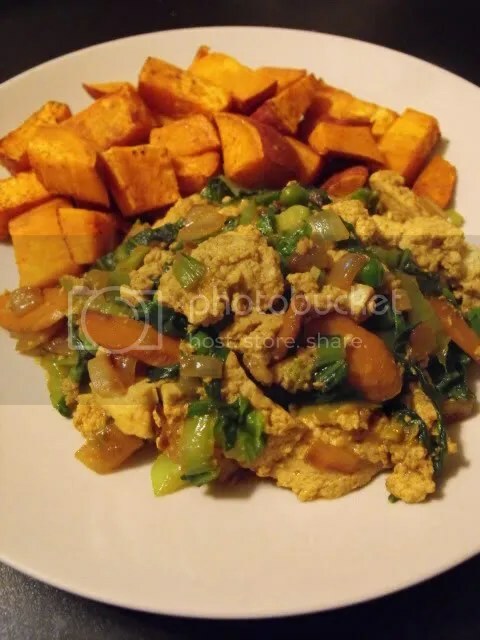 This Indonesian Vegetable and Tofu Scramble was a great way to use up all the bok choy I receive from the CSA. Adding hoisin sauce and ground coriander made it really different from other scrambles. On the side is chili-lime roasted sweet potatoes. 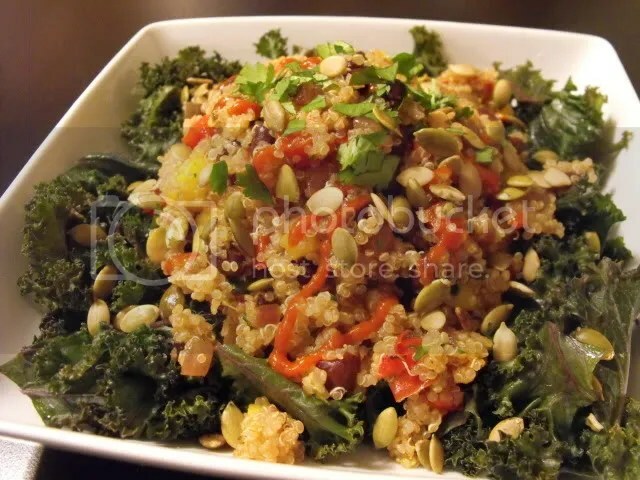 Tropical Quinoa and Black Beans develops the flavor of the islands in a short amount of time. I served it over steamed kale, topped by pumpkin seeds, which were nice textural contrasts. Since I’m also watching my budget, I turn to Vegan on the Cheap by Robin Robertson as well. 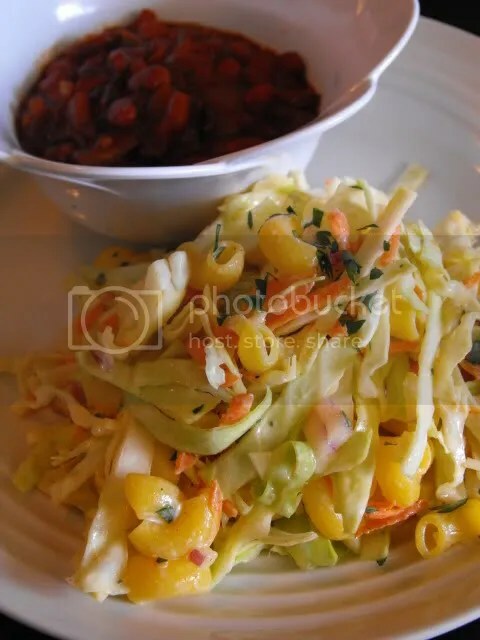 The recipes tend to rely on fresh vegetables a little less than I like, which is understandable based on the title, but I have found a few good ones so far and plan to try out more. 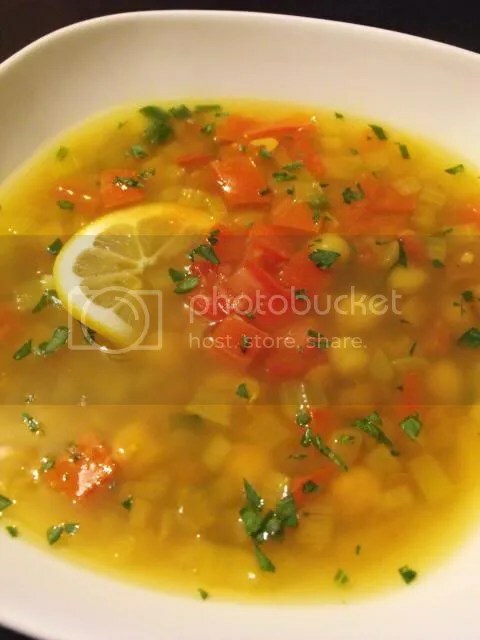 The mix of sweet and spicy in this Moroccan-Inspired Lentil Soup was great. 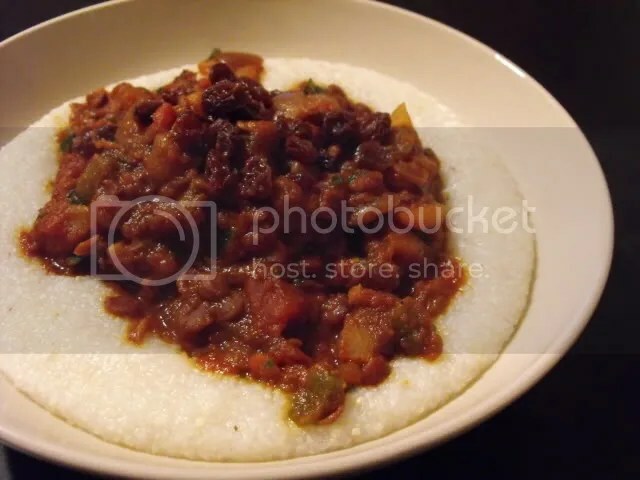 I served the thick soup over grits. 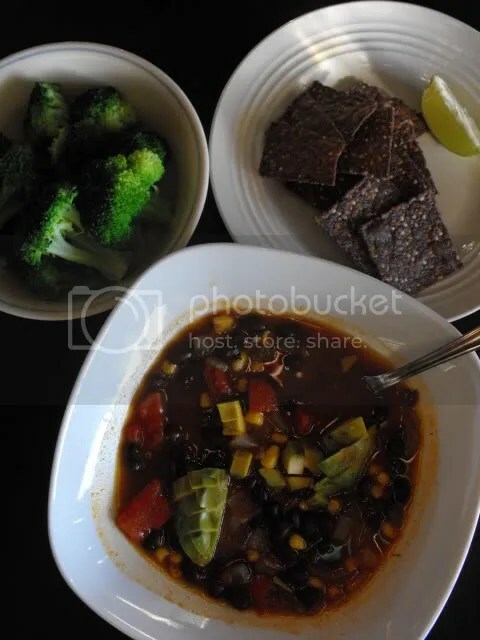 I added some chipotle chili powder to this Southwestern Black Bean and Corn Chowder, rendering it spicier than expected, but it was still quite delicious topped with avocado and served with sprouted blue corn tortilla chips and steamed broccoli. 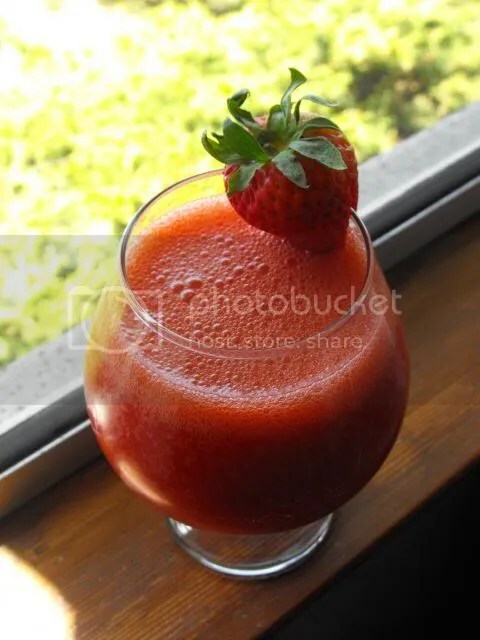 I really like raw foods during the summer months, both for their speed and simplicity. One book I’ve really been enjoying is Practically Raw by Amber Shea Crawley. Some of the recipes require time or dehydrating, yes, but many of them are really quick and accessible. The Deconstructed Sushi Bowl was a really fun way to enjoy sushi without cooking rice and bothering to roll anything. Since the meal was mostly vegetables, I bulked it up by adding edamame and a quick spicy sauce. I’ll write a full review of Practically Raw once I’ve had the chance to try more recipe! 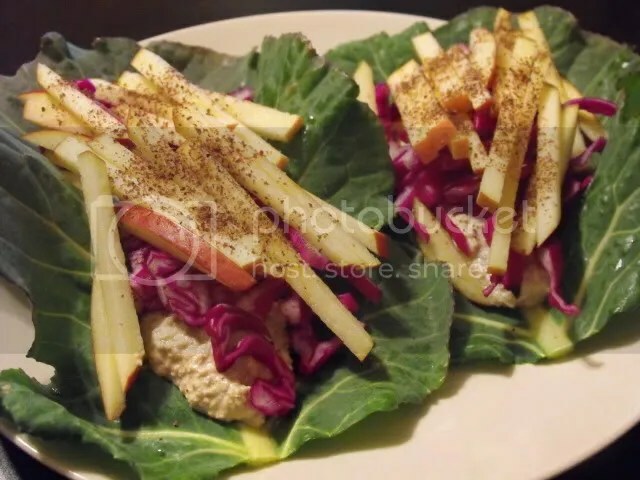 These Gingery Sunflower Seed, Cabbage, and Red Apple Rolls from Choosing Raw were simple and delicious! I wrapped mine in collard leaves instead of the nori sheets, just because that’s what I had, and the sweet apples were a great contrast to the bitter greens. One obvious time saver is the slow cooker, which I don’t utilize nearly often enough. 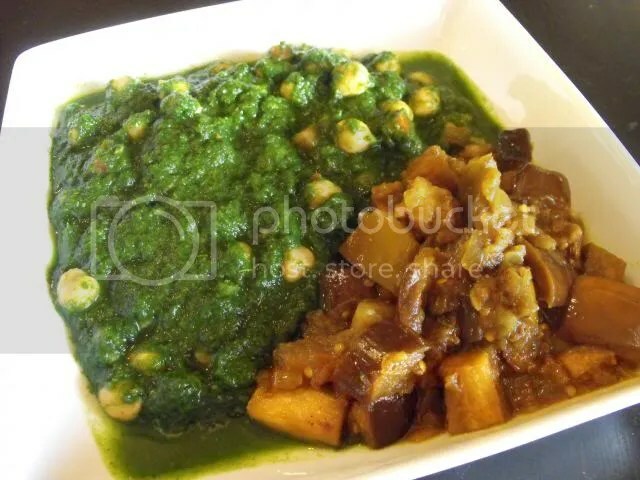 Maybe once the weather turns cool again I’ll yearn for more stew-like, comforting dishes. Here’s a non-soup recipe from The Vegan Slow Cooker by Kathy Hester, Sweet Potato Enchilada Casserole. 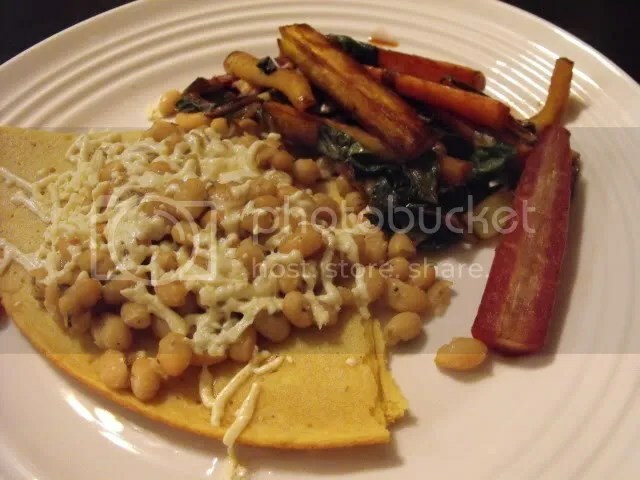 You layer corn tortillas and sweet potatoes with canned enchlada sauce and beans. The recipe called for one can of beans and vegan chorizo, but I used two cans of beans instead to try to keep it a little more whole-foods oriented. 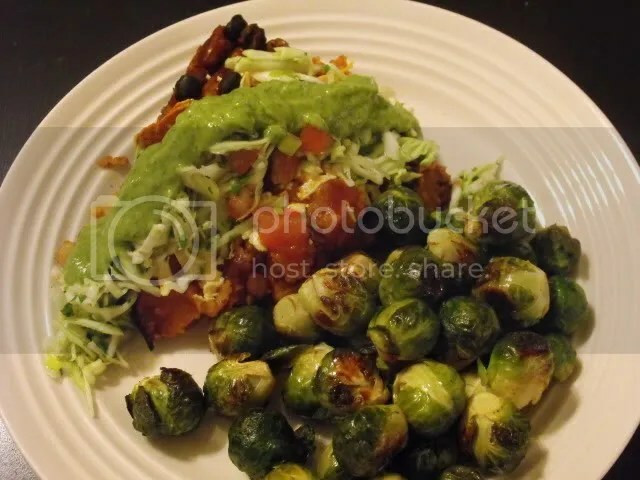 I topped the casserole with a little slaw and salsa verde that we happened to have in the fridge, and served roasted brussels sprouts on the side. 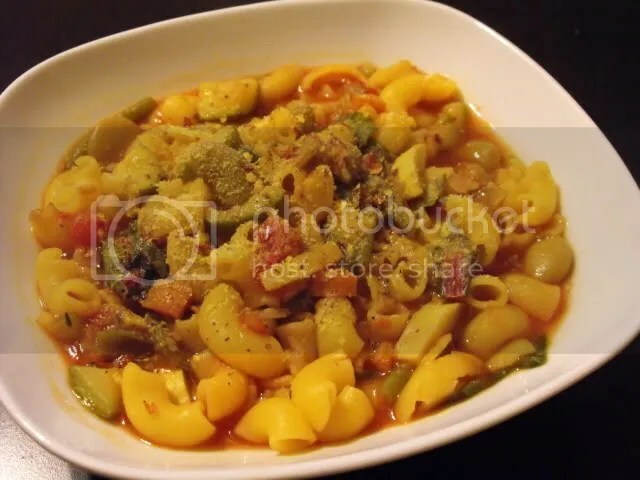 Slow cooker minestrone, adapted from this recipe, with leeks, yelllow squash, zucchini, lima beans, green beans, swiss chard, and quinoa pasta. I LOVE salads for summertime meals. 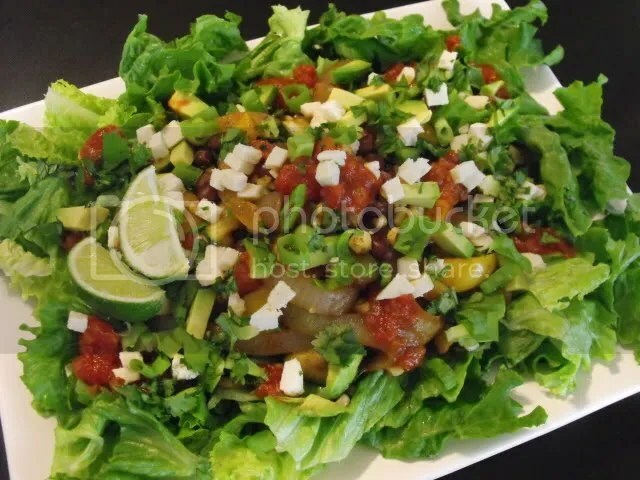 I’ve been known to use an entire head of lettuce for an entree-sized salad! 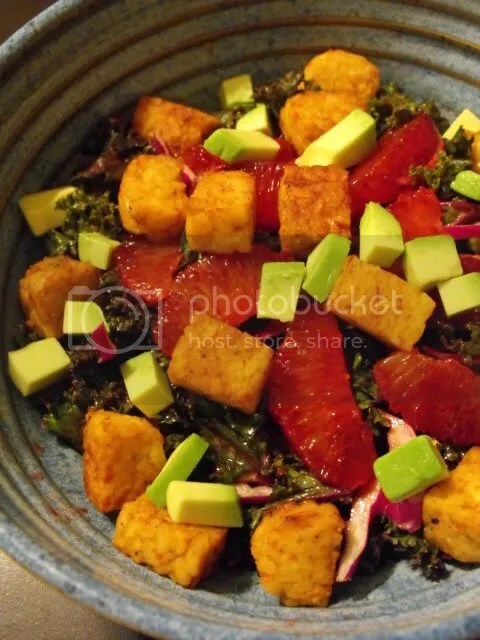 Kale salad with avocado, blood orange and chipotle-ginger tempeh. Since the tempeh was the only cooked component, this one came together quickly. Black bean, zucchini and corn fajita salad with salsa and Daiya Jack style wedges. I really like the new Daiya wedges! 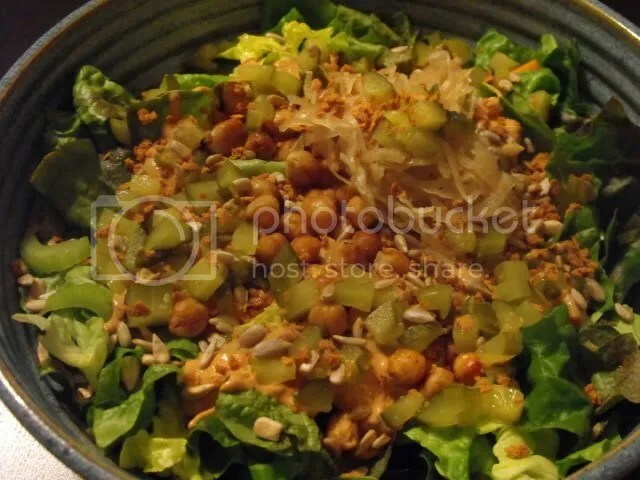 Reuben-ish salad with lettuce, carrot, celery, dill pickle, roasted chickpeas, sauerkraut, bacon bits, sunflower seeds, and Healthy Thousand Island Dressing from Eat to Live. 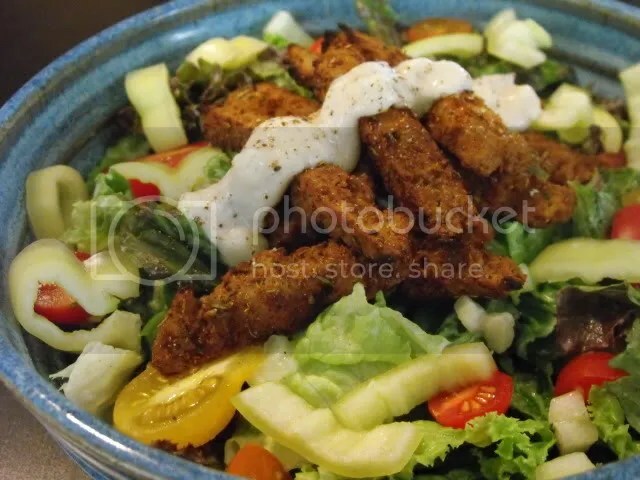 Blackened seitan salad with cusabi dressing. 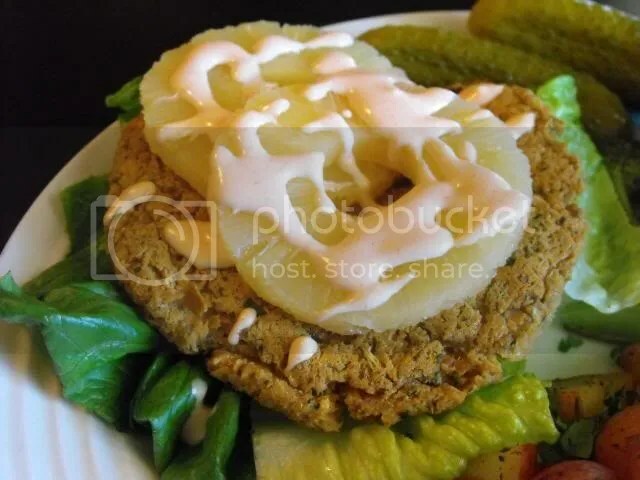 The seitan was broiled with the blackened seasoning mix from Appetite for Reduction, and the cusabi dressing was a first stab at veganizing the cucumber-wasabi dressing that turned out okay, but not great. 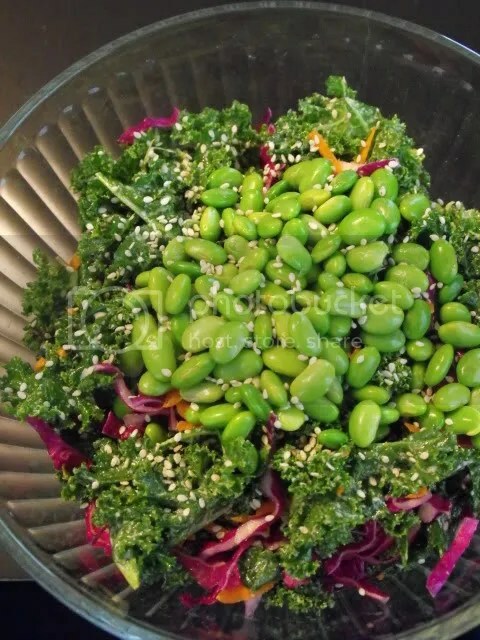 Kale salad with red cabbage, carrot, edamame, tahini dressing, and sesame seeds. 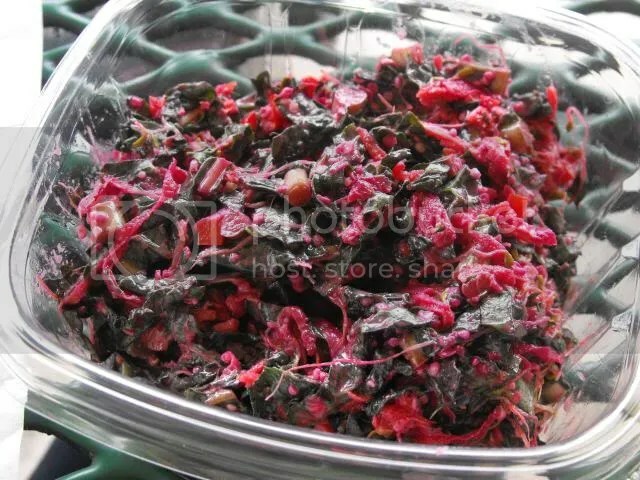 Shredded red cabbage in kale salad is my favorite! And, of course, the easiest way to make quick meals is to have some cooking knowledge and experience up your sleeve so that you can throw something together from what’s in the fridge that turns out edible! 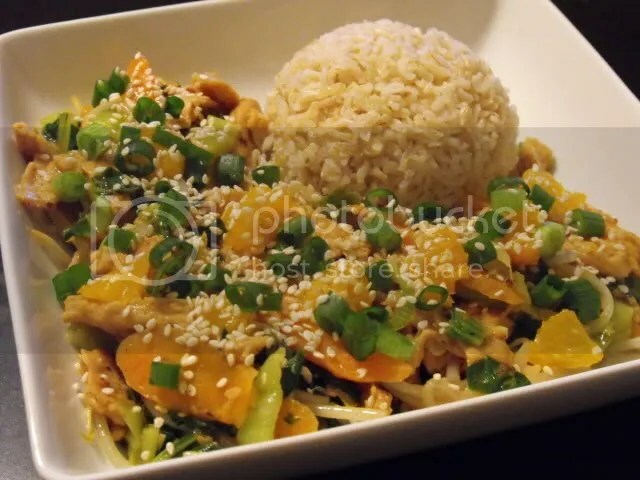 Sesame-tangerine soy curls with bok choy, bean sprouts and brown rice. 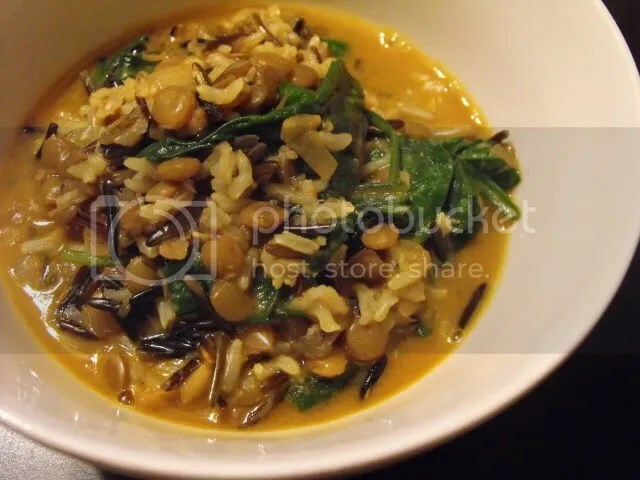 Red curry lentil stew with wild rice, brown rice and spinach. 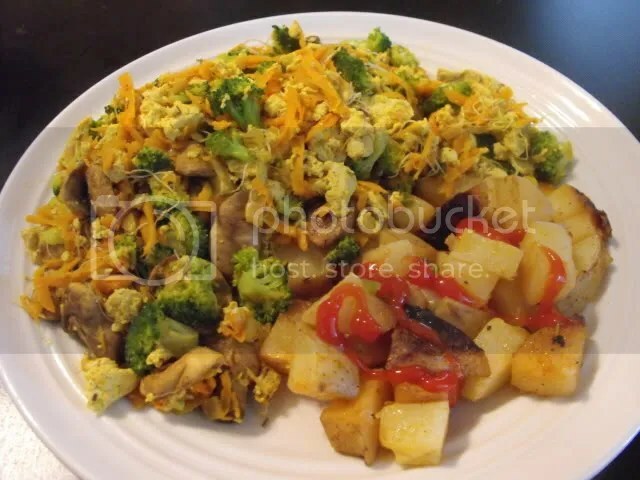 Clean-out-the-fridge tofu scramble with shallot, mushrooms, tomato, broccoli, shredded carrot, alfalfa sprouts and leftover grilled potatoes. Socca with herbed white beans, Daiya mozzarella, and balsamic roasted carrots and raddichio. Socca is the best, you just mix equal parts chickpea flour and water, a pinch of salt, and a little olive oil if you want, then cook it like crepes! 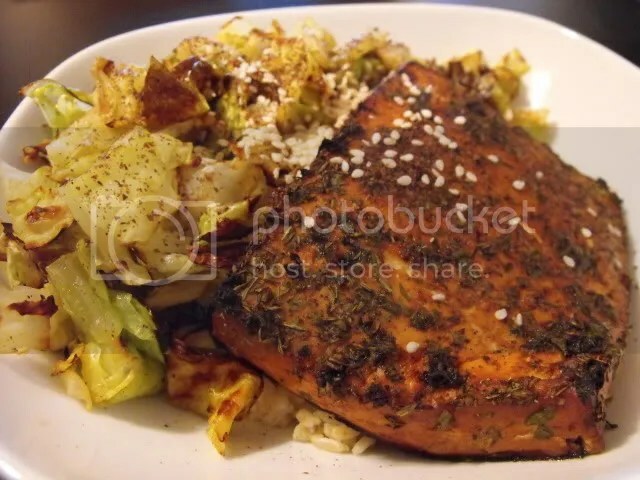 Broiled tofu and roasted cabbage over brown rice with dulse flakes and sesame seeds. And lastly, the SUPER simple. I can’t tell you how many times over the past year I’ve come home from a workout and warmed up a veggie burger because it’s all I could muster! Tofurky and hummus, my very favorite sandwich! 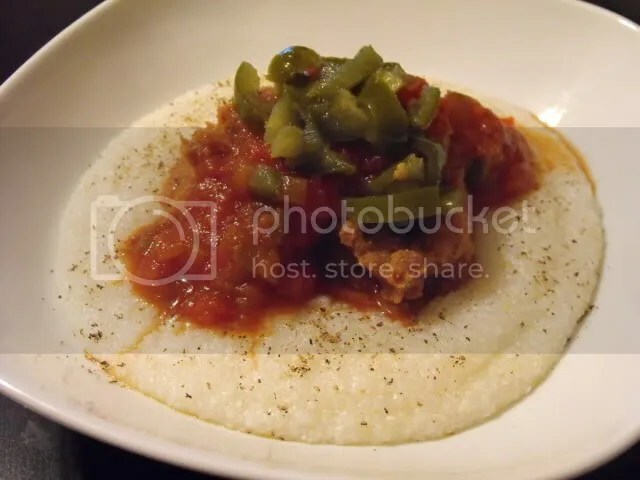 Grits, canned refried beans, salsa and pickled jalapeno. 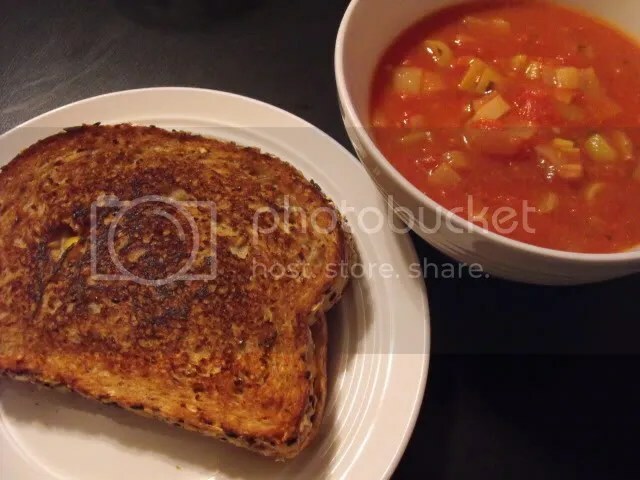 Grilled Daiya mozzarella sandwich with tomato-miso-leek soup. When I was offered a copy of The Dairy-Free & Gluten-Free Kitchen for review, I wasn’t sure if I should accept. It’s not a vegan book, not even vegetarian, and even though the recipes were dairy-free they could still contain eggs, which can be hard to replace in gluten-free recipes. 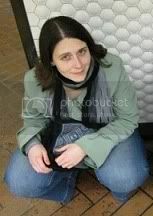 I looked into the author, Denise Jardine, and found out that she lives in the Bay Area and has worked at Whole Foods as a Healthy Eating Specialist. And, I figured the publisher wouldn’t offer me a copy unless they thought I’d like it, so I signed on. And I’m glad I did! I don’t need to eat gluten-free, but I do sometimes coincidentally by eating a whole food vegan diet, and I certainly sympathize with those who do need to eschew gluten for medical reasons. The Dairy-Free & Gluten-Free Kitchen is a great book to show anyone who might be worried about cutting out gluten that it can be done. There is a chapter on basics like gluten-free flour mix, milk alternatives, beans and whole grains, and other sections for breakfast, small bites, salads and dressings, soups, vegetarian and companion dishes, sauces and spreads, yeasted and quick breads, sweet endings, and meat and fish dishes. 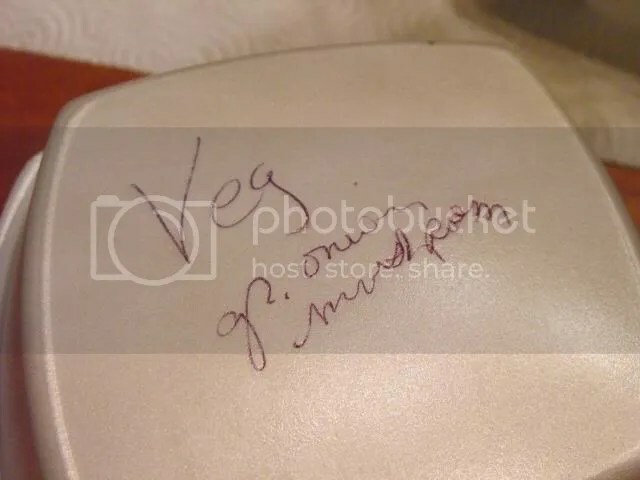 Vegetarians beware – there are pictures of meat and fish dishes sprinkled throughout those sections. The first dish that caught my eye was Oyster Mushrooms Rockefeller. For some reason I assumed the recipe wouldn’t be vegetarian, but it was completely vegan as written! To turn it into a meal, I also made the Spicy Roasted Cauliflower. The Oysters Mushrooms Rockefeller was really interesting and tasty. You layer oyster mushrooms, wilted spinach and seasoned gluten-free bread crumbs, then top it off with a cashew cream. The recipe calls for making bread crumbs from homemade gluten-free bread, but I had some store bought gf bread in the freezer so I just used that. While the flavor of the overall dish was fantastic, I would change up the method a bit next time. 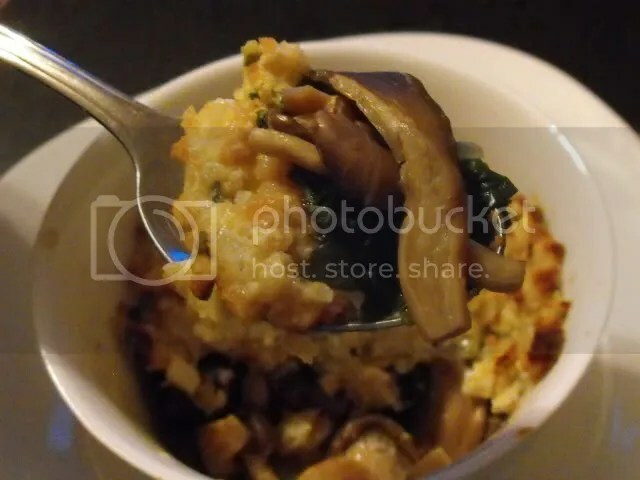 The mushrooms and spinach go in basically unseasoned, then the very flavorful bread crumb mixture went on top, so unless you got a bite with every layer it was a little unbalanced. I would add a pinch of salt to the mushrooms and spinach, and maybe mix some of the breadcrumbs through, and then I think it would be really outstanding. 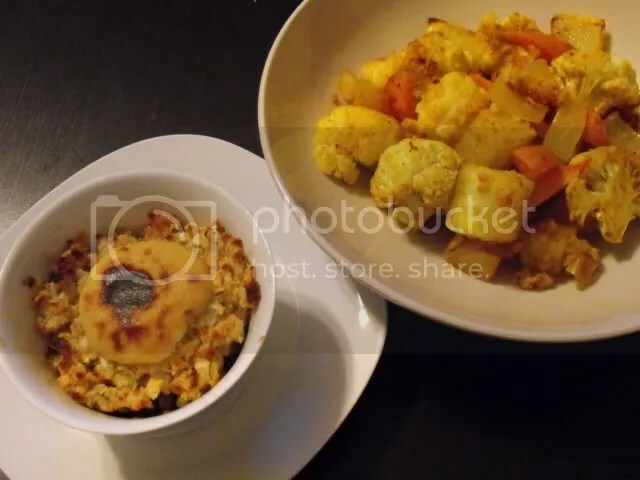 The Spicy Roasted Cauliflower was good, and also included carrots, potato and onion. 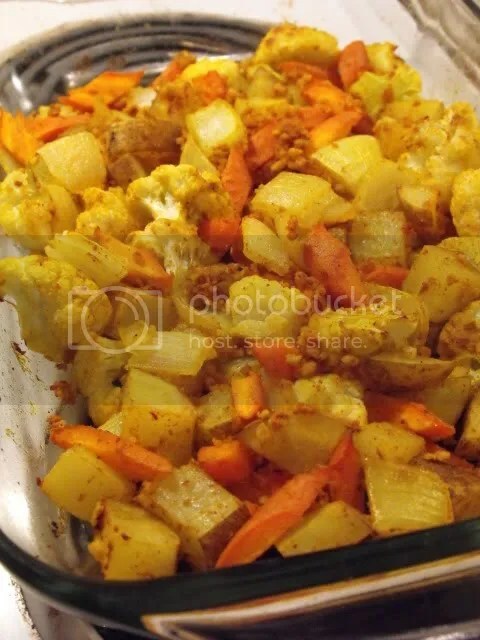 It was a basic roasted vegetable dish with curry powder and other spices, with some gf bread crumbs tossed in for crunch. Next I wanted to veganize one of the meat dishes, since I figured it was a shame to skip over two whole chapters. I chose the first recipe listed, Poached Cod Over Glass Noodles, because it sounded really healthy and flavorful. 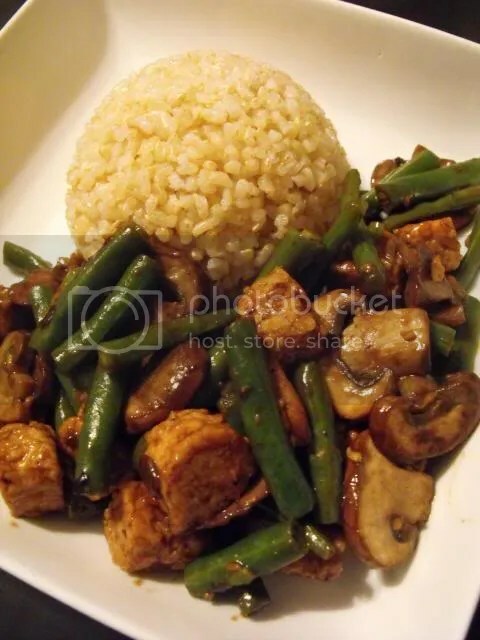 My plan was to substitute tofu, although I wasn’t sure how well braised tofu would work out. The answer is that braised tofu can be amazing. You can’t really tell from the picture, but this tofu was so flavorful. The broth was hearty, sweet, sour and pungent, with flavors from tomatoes, date syrup, lemongrass and ginger. The bean thread noodles were a great textural complement, and while the bok choy was tricky to cut into, it made for a nice presentation. I figured in order to do the book justice, I ought to try one of the breads using the gluten-free flour mix. 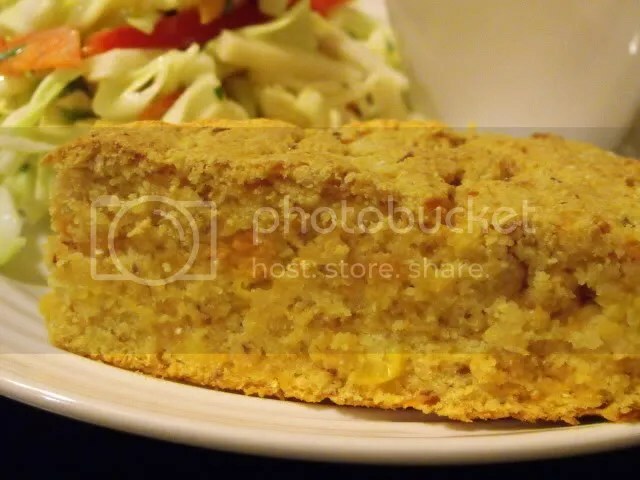 Many of the bread recipes do have eggs, so I attempted to veganize the Sweet Potato Cornbread. 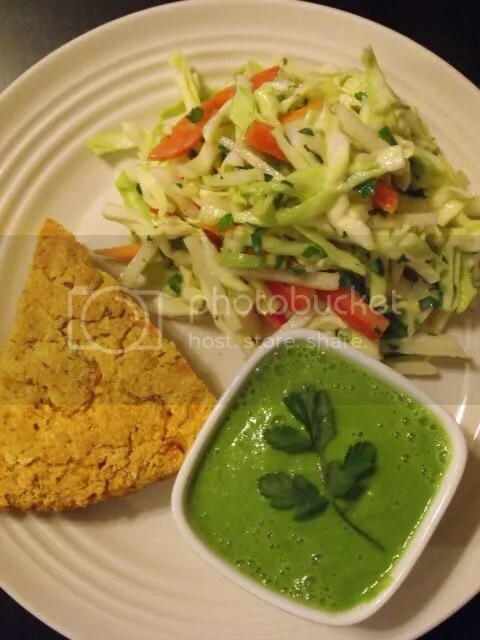 I rounded out the meal with the Spicy Green Smoothie and the Sweet and Tangy Jicama Slaw. I served the Spicy Green Smoothie as a cold soup, which worked out nicely. It was light, refreshing and spicy, but also smooth from avocado. 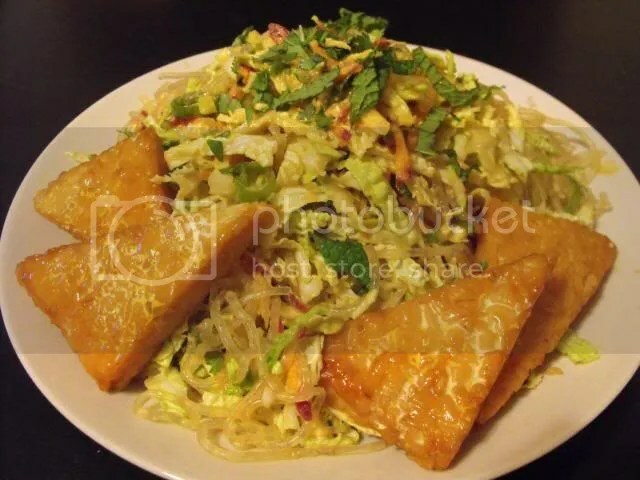 The Jicama Slaw was crunchy and tasty, with cabbage, carrot, red bell pepper and a dairy-free mayonnaise based dressing. I wouldn’t really say that I got the “sweet and tangy” part though, I thought the dressing could’ve been a little more flavorful. Maybe it just seemed that way because I was having it with the spicy smoothie though. The Sweet Potato Cornbread worked out pretty well, considering it was gluten-free, dairy-free, egg-free AND sugar-free. Right after baking it was pretty squishy and had a soft, dense texture, but after sitting overnight it firmed up a bit and felt more like “normal” cornbread. Even though it’s not a vegan cookbook, I’m happy to have The Dairy-Free and Gluten-Free Kitchen in my arsenal. While some of the recipes are quite basic (I don’t think you need a recipe to make gf French toast if you know that gf bread exists), some of the recipes are really interesting and quite delicious. 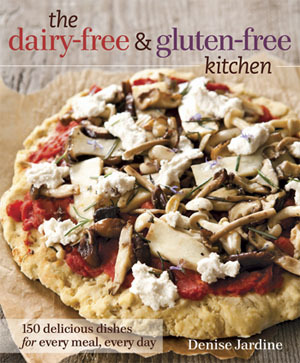 I would definitely recommend the book to anyone seeking whole foods based dairy-free and gluten-free recipes. Disclaimer: I received a free copy of this book for review purposes. 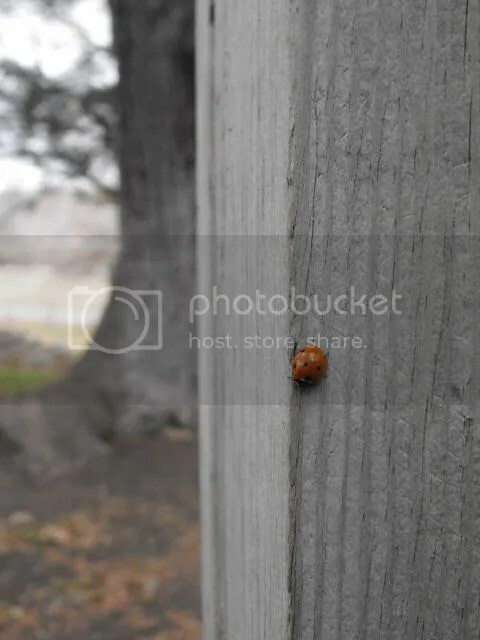 The words, opinions and photos here are entirely my own. So, the funny thing about choosing chervil from the Flavor Bible is that I couldn’t find chervil anywhere, fresh or dried. Apparently chervil is quite fragile and hard to stock. Regardless, I forged ahead with my idea. Chervil, page 113, is a key ingredient of fines herbes, along with chives, parsley and tarragon. Other flavor matches are leeks, lemon juice and peas, and I served my dinner along with one more match, potatoes. My original intent was to stuff the herbs inside the tofu, but my tofu slices were pretty thin, so I put the herbs on the outside instead. 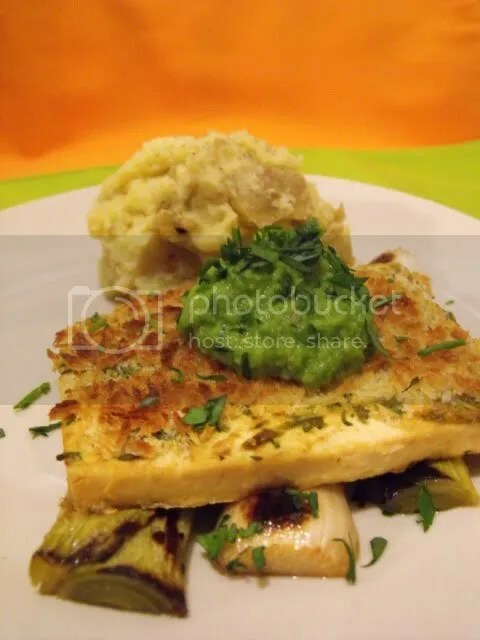 The balance of flavors in this dish is great; the leeks are soft and sweet, the tofu is chewy and herbaceous, and the pea puree is salty, tangy and smooth. Even with multiple strong flavors going on, the delicate fresh herbs shine through. I had truffled mashed potatoes on the side, but crispy roasted potatoes would be a nice texture contrast too. 1. Preheat the oven to 375 F and heat a wide pan over medium-high heat. 2. Trim most of the green parts off of the leeks and discard, leaving the white and light green parts. Trim the root ends, leaving enough so that the leeks hold together. Cut each leek in half lengthwise then rinse to remove any dirt, separating the layers. Set aside. 3. In a small bowl, combine the dijon mustard, vegetable broth, herbs, salt and pepper, and mix well. 4. Line a baking sheet with parchment paper and spray with oil. Spread some of the mustard mixture thinly on a slice of tofu, then sprinkle with 1 Tbs of panko and pat the breadcrumbs into the mustard. Place the tofu on the baking sheet breadcrumbs down, and repeat with the rest of the tofu. Aim to use about half of the mustard mixture on the bottoms of the tofu. 5. Spread the rest of the mustard mixture on the tops of the tofu and sprinkle 1 Tbs of panko on each piece. Pat the breadcrumbs into the mustard. Once all of the tofu pieces have been topped with breadcrumbs, spray with oil. 6. 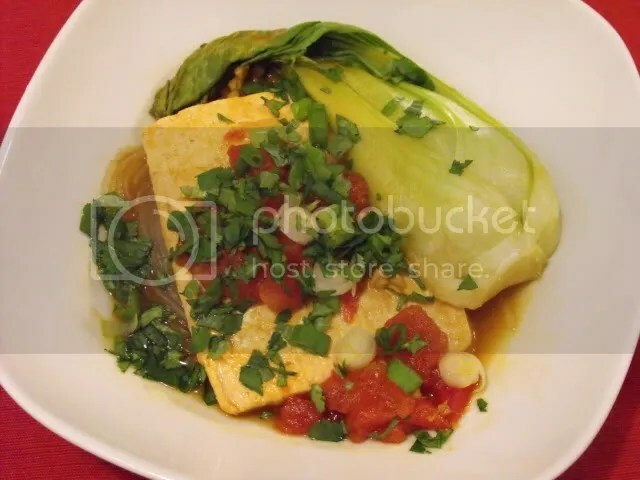 Bake the tofu for 30 minutes. 7. Meanwhile, melt the Earth Balance in the hot pan. Add the leeks cut side up and cook for a few minutes, until browned. Flip the leeks and continue to cook for a few minutes. 8. Add the wine to the pan (it will hiss), then drizzle the agave nectar over the leeks and sprinkle in the lemon zest and salt. Shake the pan to combine. 9. Cover the pan, turn the heat down to medium-low, and braise the leeks for 30 minutes, until a sharp knife is easily inserted near the roots. Most of the liquid should have evaporated. 10. While the tofu and leeks are cooking, prepare the pea puree. 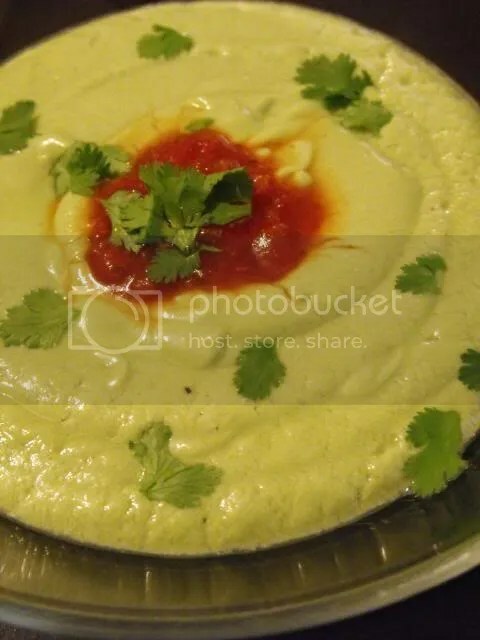 Place all puree ingredients (peas through vegetable broth) in a food processor and blend until smooth, stopping to scrape down the sides as needed. 11. 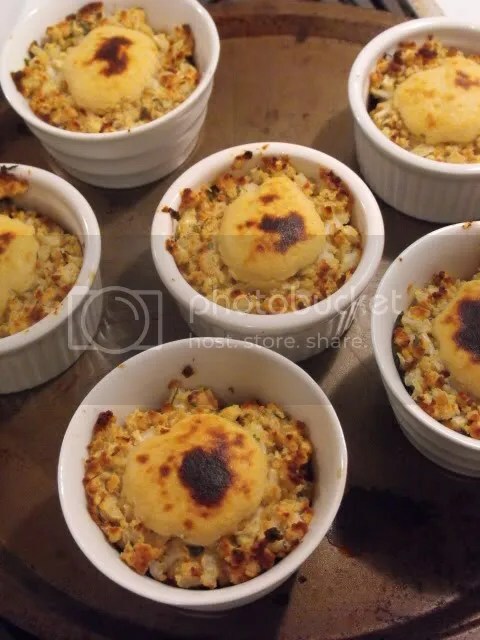 If the tofu is not browned on top after baking 30 minutes, place it under the broiler, watching very carefully, for a minute or two, just until browned. 12. To serve, lay three leeks on each plate. 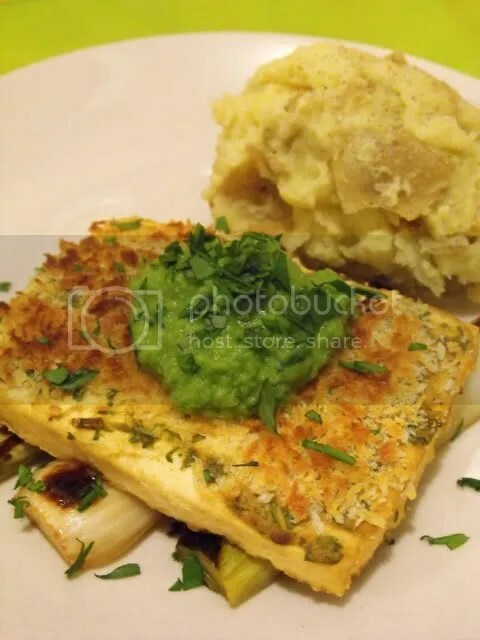 Place a piece of tofu on top of the leeks, then a dollop of pea puree on the tofu. 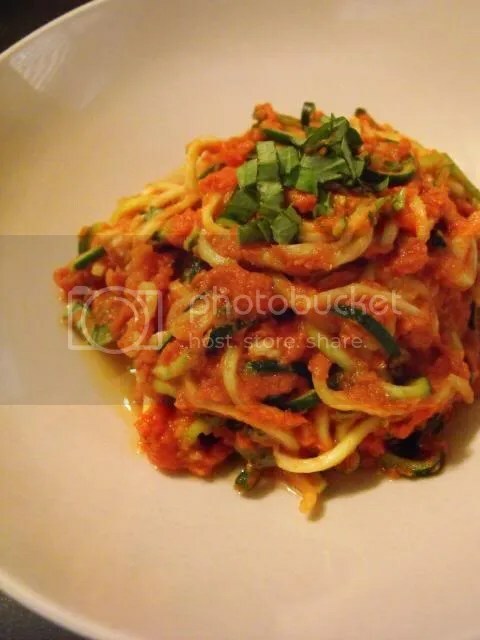 FatFree Vegan Kitchen is one of the blogs I’ve been reading the longest, practically since I first went vegan way back when. Susan cooks without any added oil, although some of her recipes do include fats such as nuts and avocados. Completely oil-free cooking is somewhat foreign to me, but I do love a low-fat recipe made using whole ingredients. 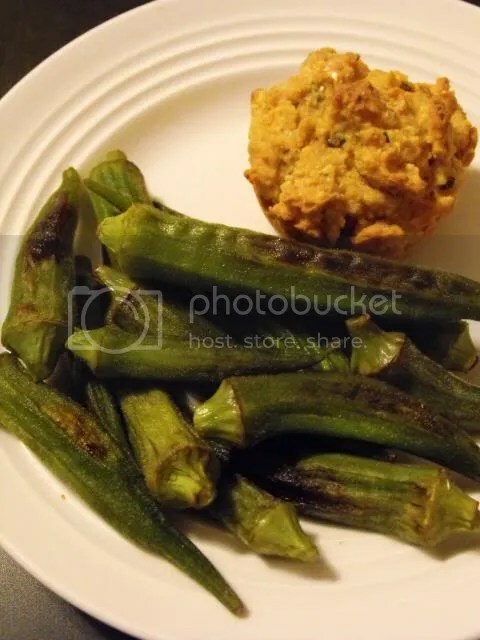 In addition to posting her own recipes, Susan maintains a database of oil-free vegan recipes submitted by others. 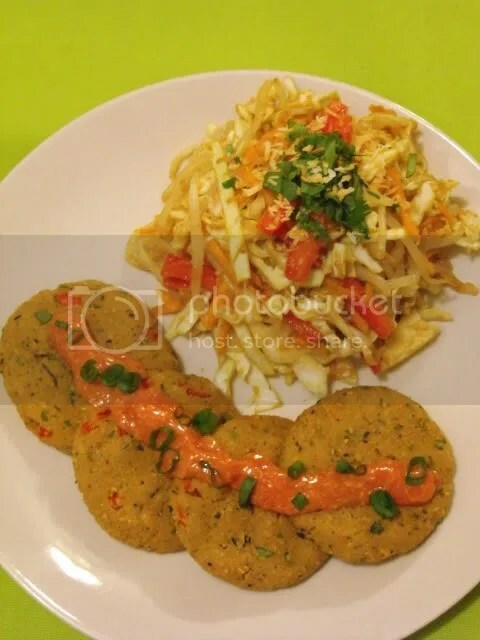 I chose two recipes from the blog which I thought would go well together, Green Curry Tofu Cakes and Bean Sprouts and Broccoli Slaw Salad with Coconut-Ginger Dressing. You start the tofu cakes by soaking arame and chia seeds, which give a seafood-ish flavor and bind the cakes, respectively. 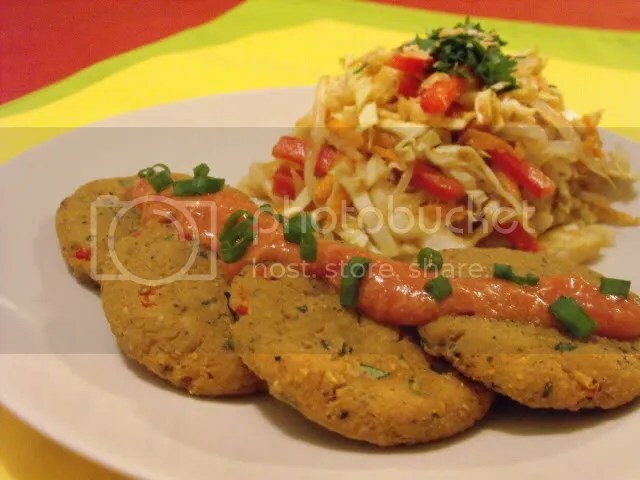 Then you mix together tofu, nutritional yeast, tamari, green curry paste and quinoa flakes or quick oats and form ’em into patties. My tofu was extra-extra-firm and I actually had to add a little more liquid to get the mixture to blend, but even then it was very easy to handle. There is an option to bread the patties which would have been good, but I skipped it both to save on calories and avoid an extra step. As suggested, I served the cakes with horseradish-spiked ketchup, which was a great idea. The ketchup actually overpowered the mildly flavored cakes a bit; I could’ve used more green curry flavor and would add even more next time. 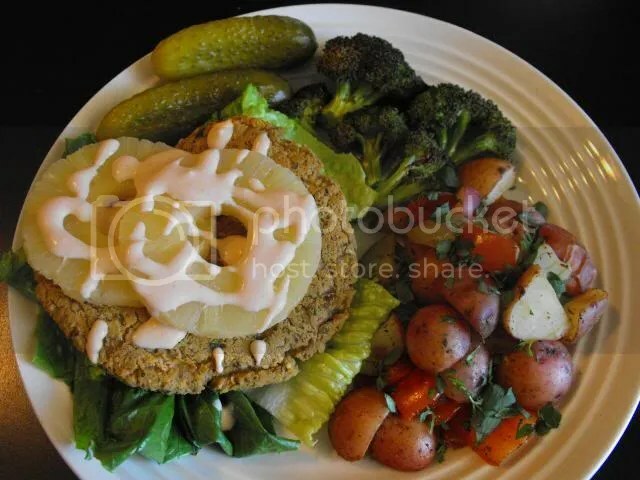 The absolute stand out of this meal was the coconut-ginger salad dressing. If my face fit in the blender I would have licked it clean. The balance of toasted coconut, ginger, sweet, salty and sour from tamarind concentrate was perfect. 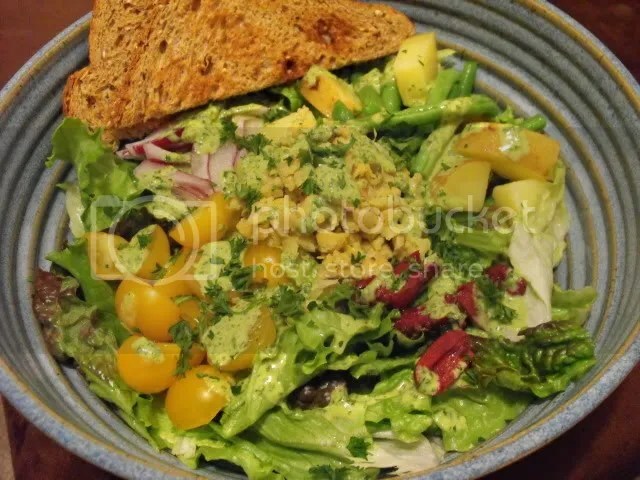 The salad itself was very simple. I used shredded cabbage in place of the broccoli slaw just because I had a whole head in the fridge. 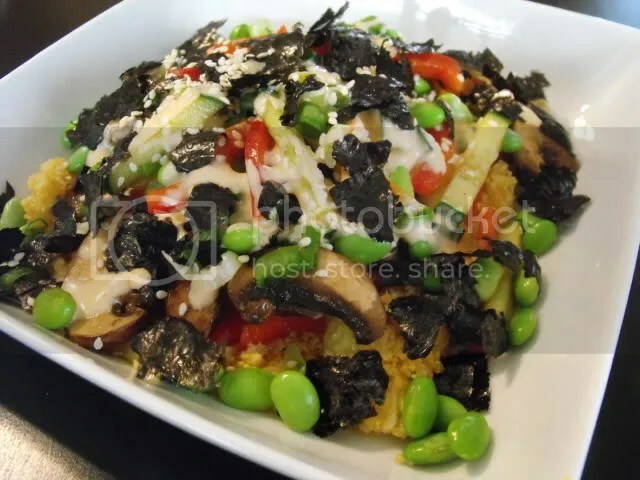 If you haven’t checked out FatFree Vegan Kitchen’s recipes yet, take a look! Susan really knows what she’s doing with flavors, and she makes oil-free cooking delicious. I think Hannah of Bittersweet needs no introduction, but I’ll try anyway. 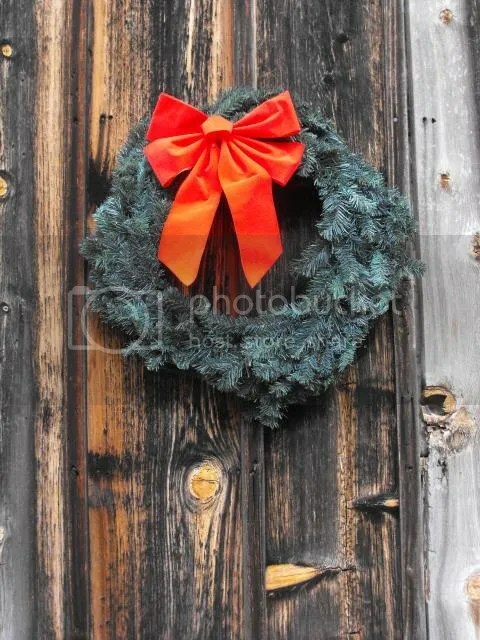 She is a blogger, cookbook author, photographer, crafter…just thinking about it all makes me tired! I had the pleasure of meeting Hannah briefly at the end of Vida Vegan Con, and she was just as nice in person as I would have hoped. 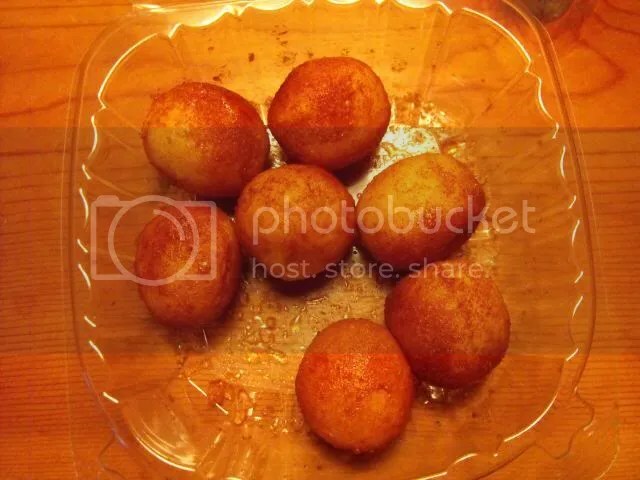 Hannah is best known for her sweet treats, but she has posted a number of savory recipes as well. I’ve made her Cold Sesame Noodles before and enjoyed it, so I wanted to choose another recipes I could eat as a main dish for dinner. 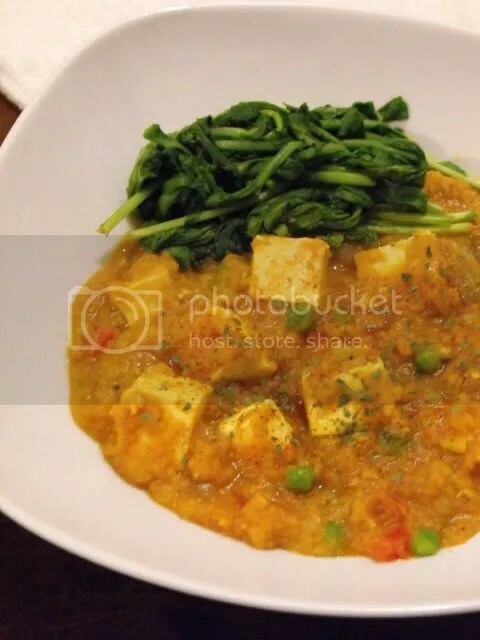 This is Matar Tofu Paneer Dahl, which is a mashup of Matar Paneer and Dahl. It was a really tasty and easy to make one pot dish. I don’t have a Tofu Xpress (yet! 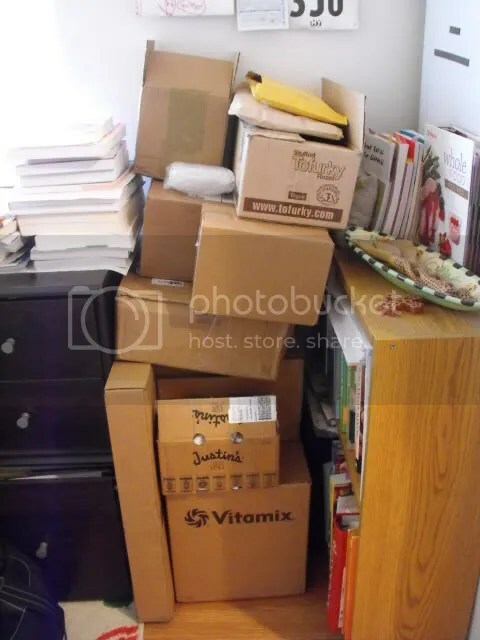 ), so I used the old school method of stacking a bunch of heavy stuff on top of my tofu. 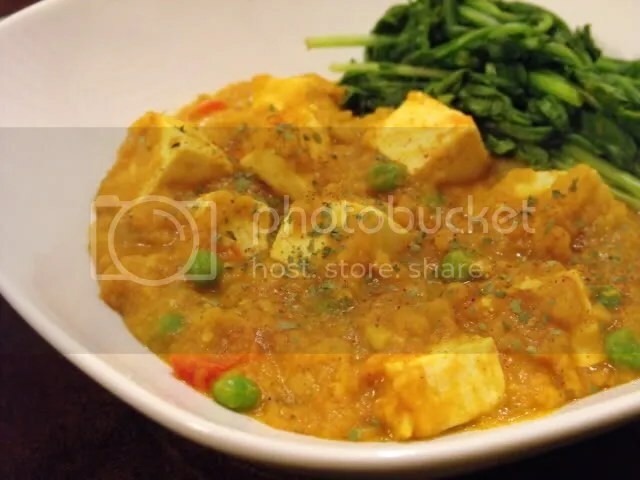 The tofu is a substitute for paneer here, but it’s not really masquerading…it is indeed just blocks of extra firm tofu simmered in a delicious sauce. Luckily for me, I don’t mind plain tofu too much so it was not off putting. The extra firm texture was a nice contrast to the soft red lentils. No tofu haters allowed! I added some cayenne pepper to bump up the heat, and served the dahl with steamed arugula.